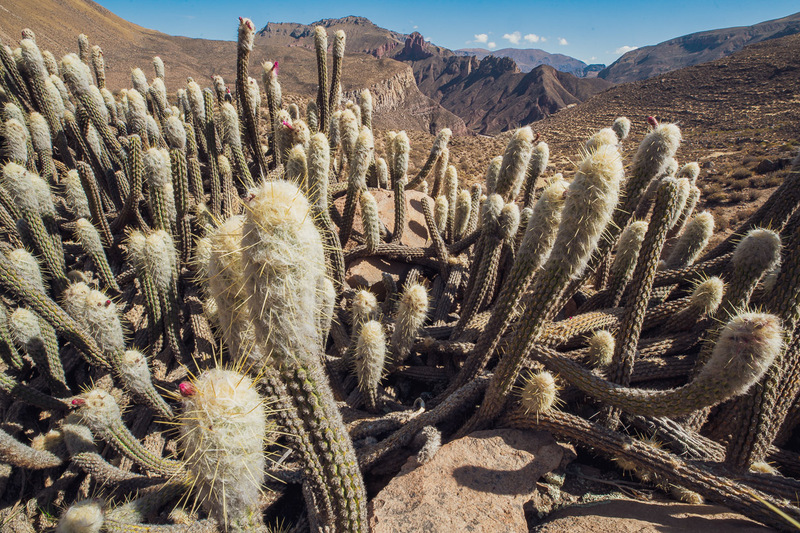 This post comes from just inside the Bolivia border, at Copacabana. 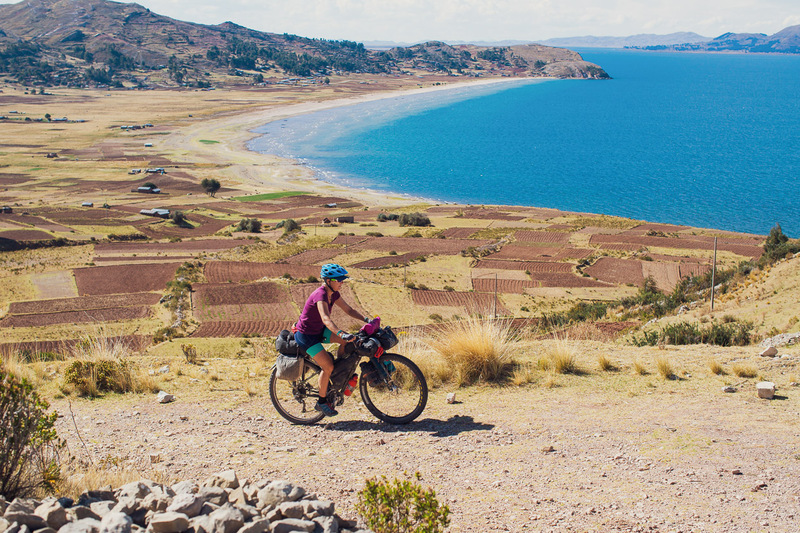 It has been a fascinating and tough 10 day ride from Arequipa to here, once more crossing the Continental Divide of Perú and tackling an amazing variety of terrain; from volcanic desert, to a cactus studded canyon, to the breezy blue skies of the Lake Titicaca Basin. We followed a route we’d planned using Ride with GPS (map and GPX at end of post), intentionally linking up the most interesting landscapes and places of interest we could find on a route eastwards. 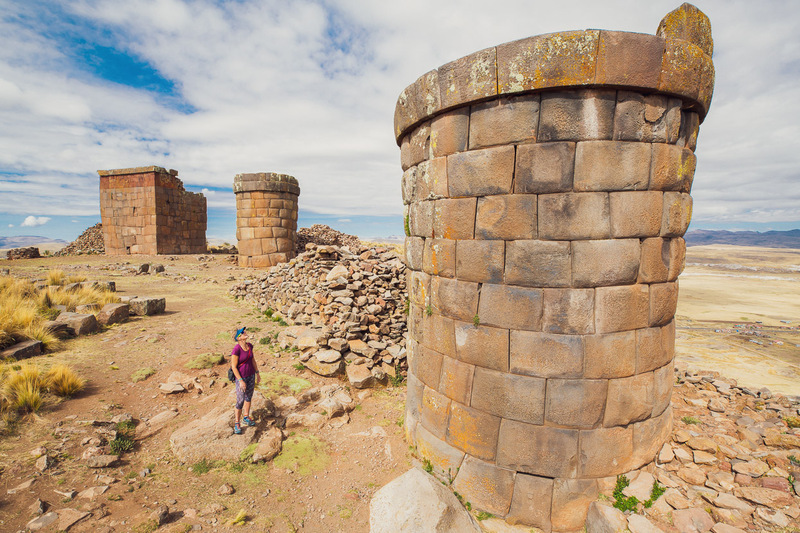 The result has been a satisfying ride that has not only included some epic landscapes, but a good dose of archeological and cultural interest too. 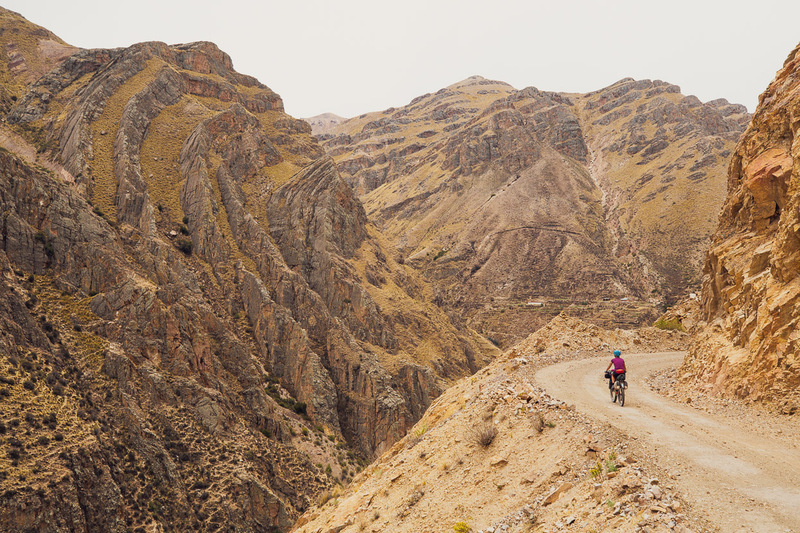 We’ve been in Peru just over five months now, after originally estimating around three months for our through-ride. 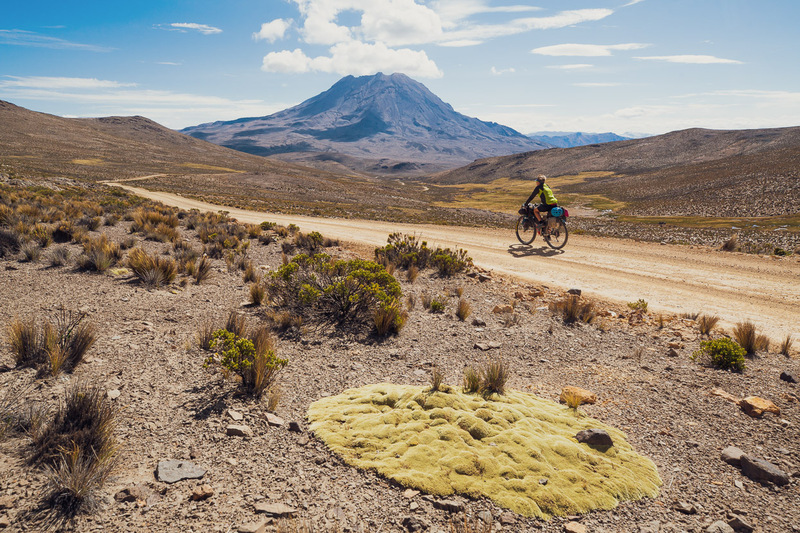 For mountain-loving touring cyclists, this country is just perfect, with its cultural diversity, deserted roads and hugely diverse landscapes. It’s a place that’s definitely gotten under our skin, and the more we learn about the country the more we want to see. 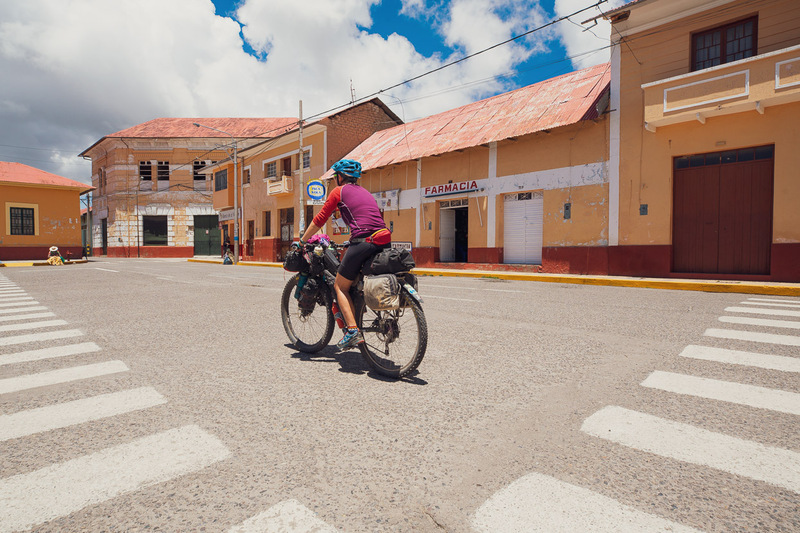 It’s hard to look ahead to Bolivia and beyond right now, while we feel we still have unfinished business here, and that’s after literally riding border to border the length of the country. 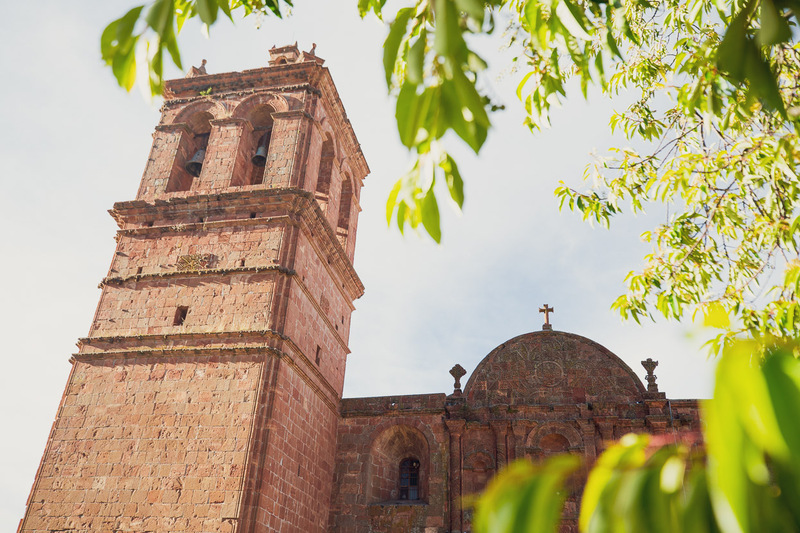 Cusco, the Sacred Valley, Ausangate and the Eastern Cordillera are places we’ve yet to see, but the wet season is well upon us now, and so is the imminent expiration of our current visa. 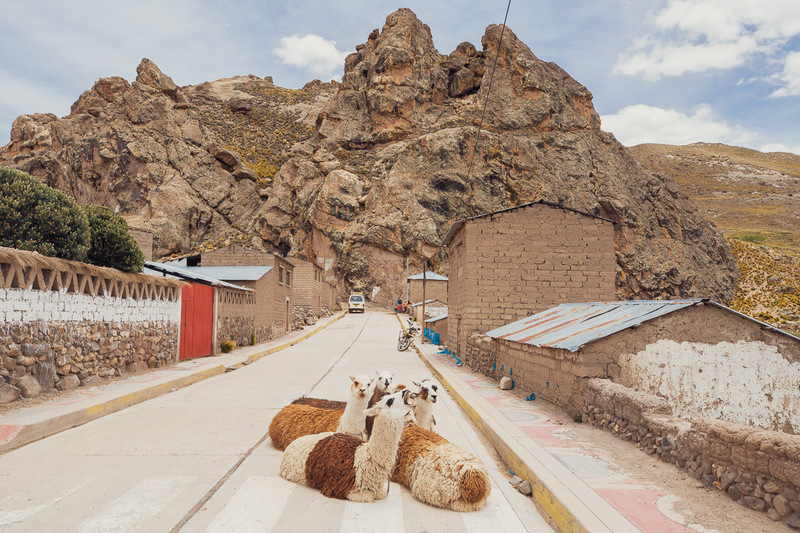 And so, we’ve decided to about-turn from just inside Bolivia and make our way up the eastern side of Lake Titicaca and try to gain a second 180-day visa for Perú, and thence make our way to Cusco. Nearly two and a half years we’ve been on the road now without a big break. It’s hard to believe it’s been that long already, but I only need to go into day-dream mode for a moment and I can clutch at any one of the thousands of memory fragments that fill my brain; moments – salient for whatever reason – that come to the surface in a reflective moment and remind me really how long we have been riding. We’re still motivated to keep making more of those moments. But we could do with a break, and the weather’s only going to get wetter, and the roads muddier; so our current plan is to cease the south-bound mission for a few months and hang out in Perú for a while, splitting our time between Cusco and Huaraz and possibly exploring a bit of Brazil, until the weather is good enough to get back into the mountains. We’ll do some work, and ride our bikes on shorter trips as the weather allows. It feels like the right time and we’re looking forward to reflecting further on the ground covered so far, writing about it and publishing more content on the website. 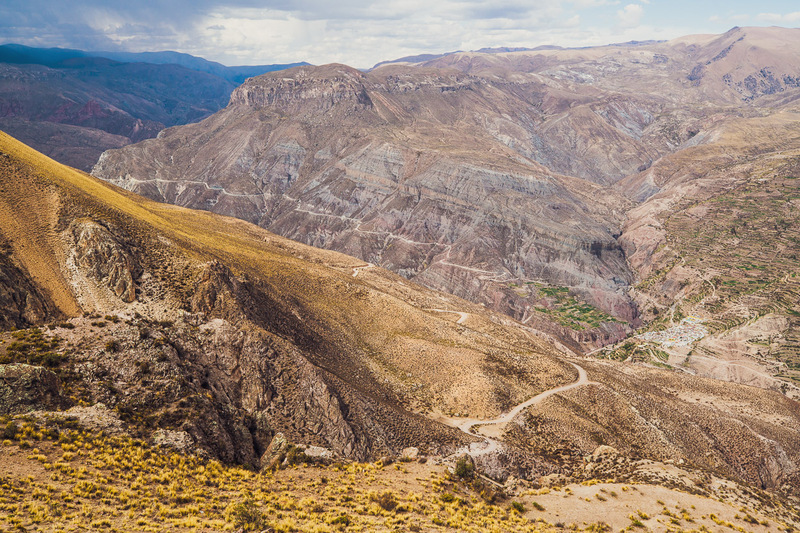 If you’re headed back to the divide, the only way out from Arequipa is up, and up and up. In our case a 55 km climb, gaining 2200 vertical metres. 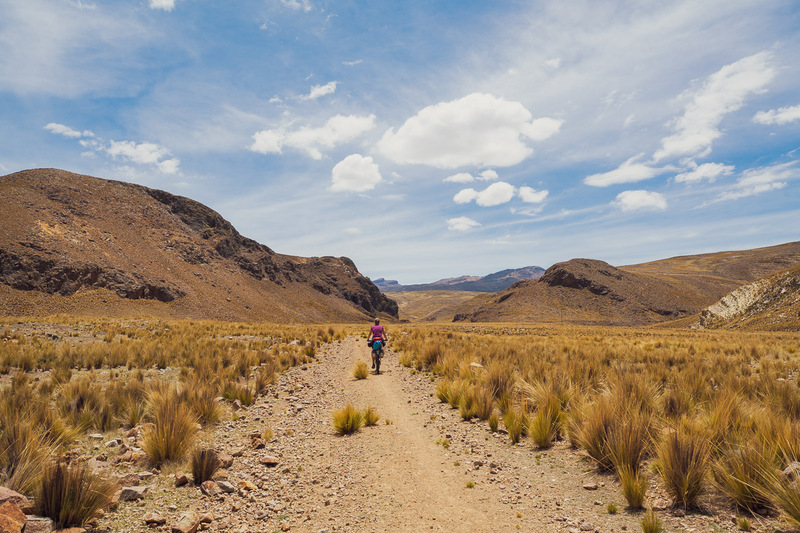 As usual when we leave a city, we didn’t get away until midday, and had a solid few hours of climbing until we stopped and camped near the side of the dirt road at about 3500m. 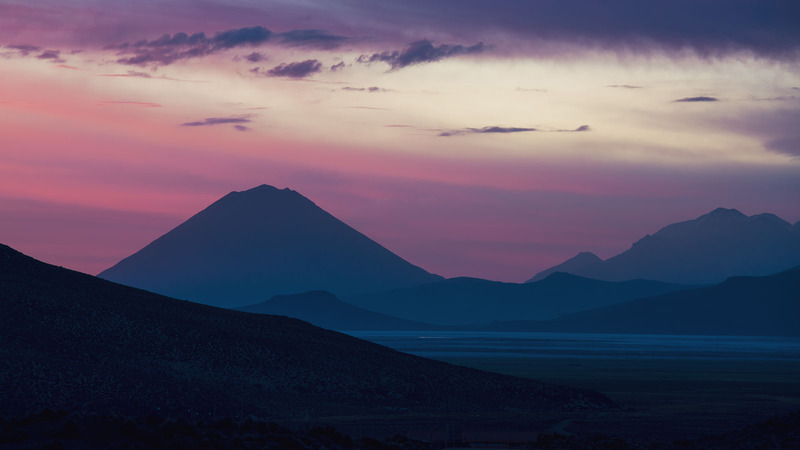 The city farewelled us with a spectacular sunset and nice views of Volcan Misti. 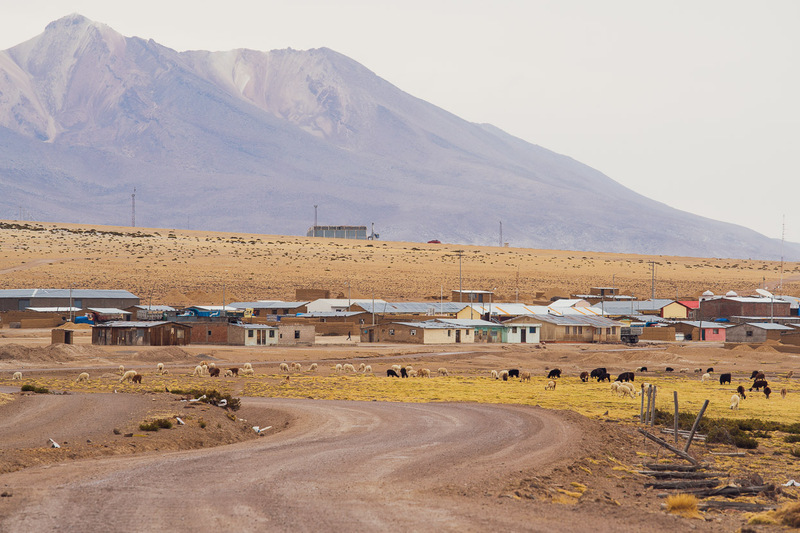 Not only is the climb out of Arequipa long, but it’s also on a wide dusty road that’s quite busy with trucks carrying loads from the salt mine above on the puna. 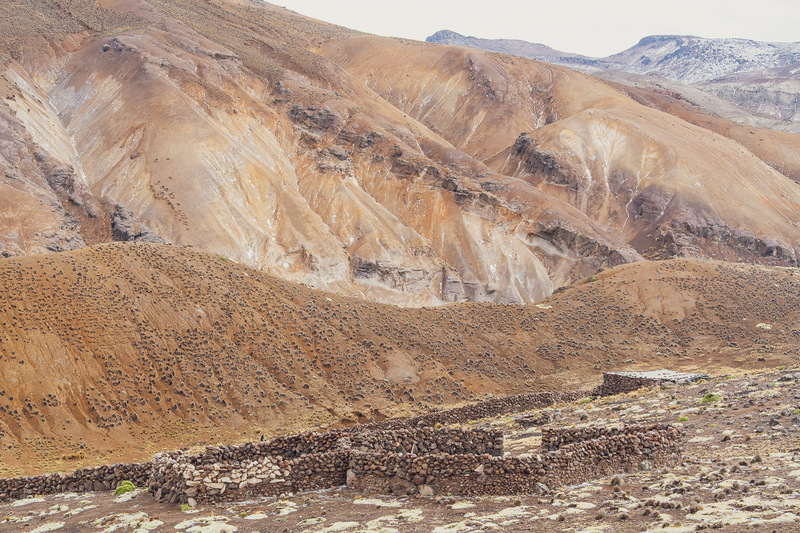 Not the greatest climb in the world, especially on legs dulled from too much sitting around in Arequipa’s cafes. 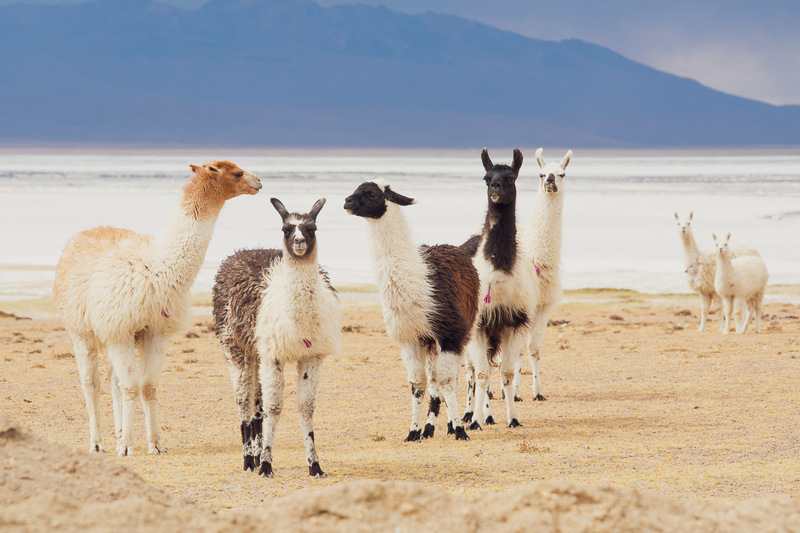 But eventually (after lunch on day two) we topped out to the spectacular site of Laguna Salinas – a huge salt flat that stretches across a huge basin in the puna. 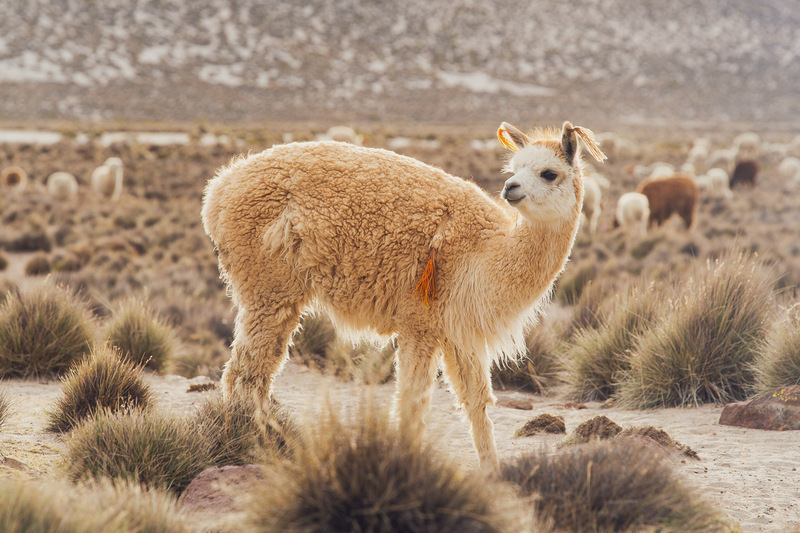 Some vicuña were running around on it, and around the fringes llama and alpaca were grazing. 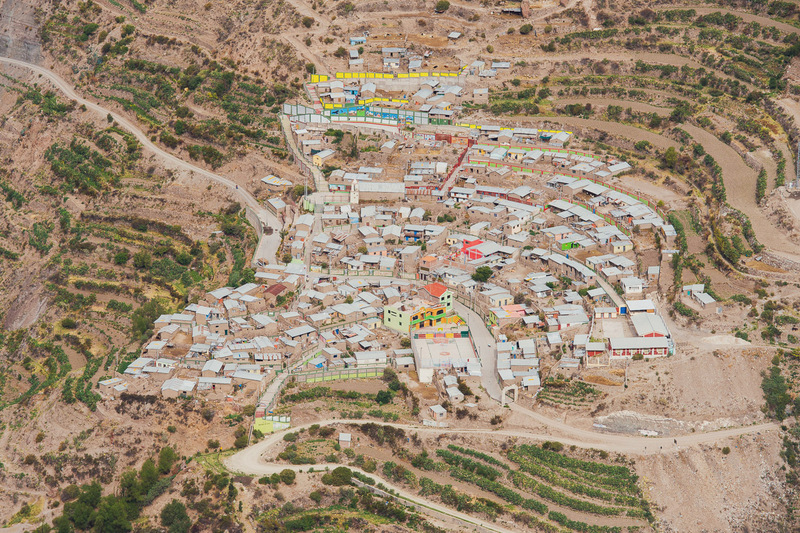 There’s no water from about a third of the way up the climb, so we’d been carrying about a day’s worth from the village of Chiguata and were happy to reach Salinas Moche where we could resupply. 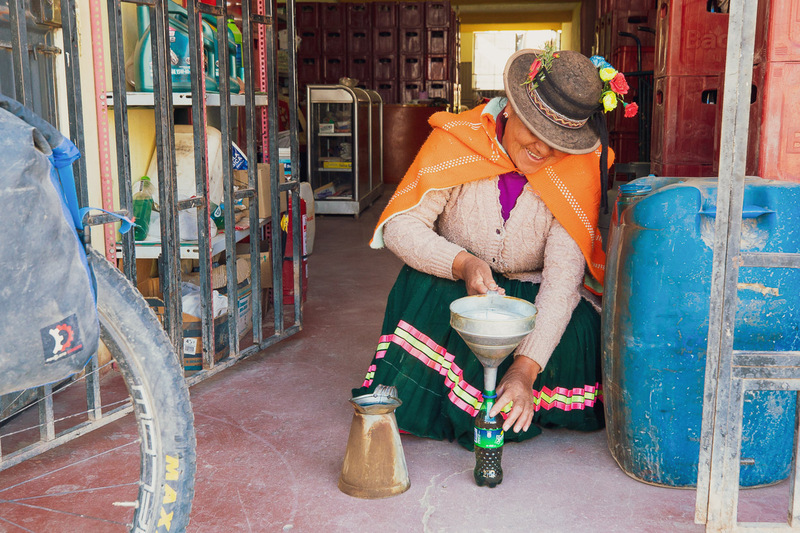 Despite being a mining support village, there’s no restaurant, but possibly a community hostel, so we asked the woman who ran the tienda to make us a coffee, picked up more food and water and pedalled on. 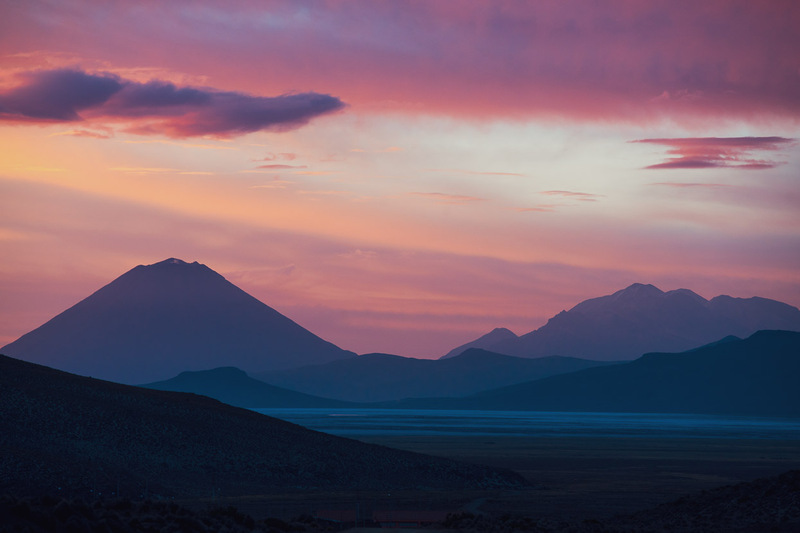 We camped that night at just over 4400m, with epic views of Volcan Misti (5822m) and Volcan Chachani (6075m) across Laguna Salinas. We felt pretty stoked to have stood on the summit of the latter a couple of weeks back. 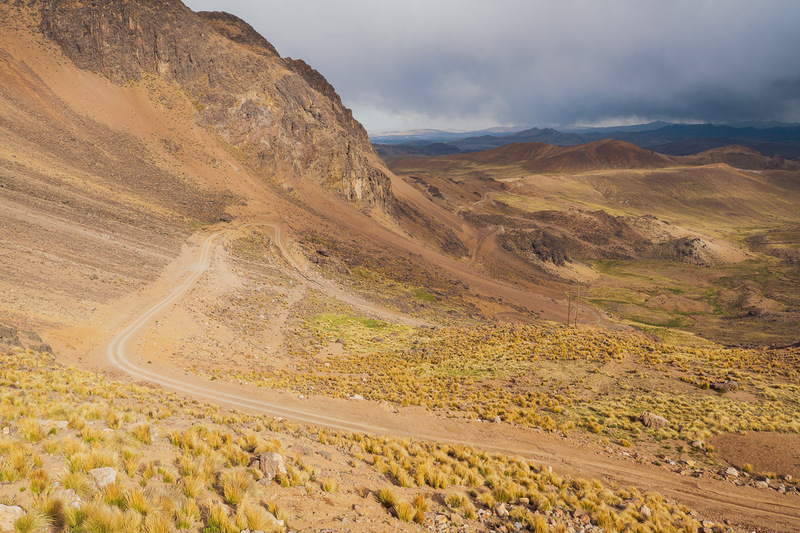 It felt really good to be back in the distinctive landscape of Peru’s puna, away from the mining trucks and dust and to have the road totally to ourselves. 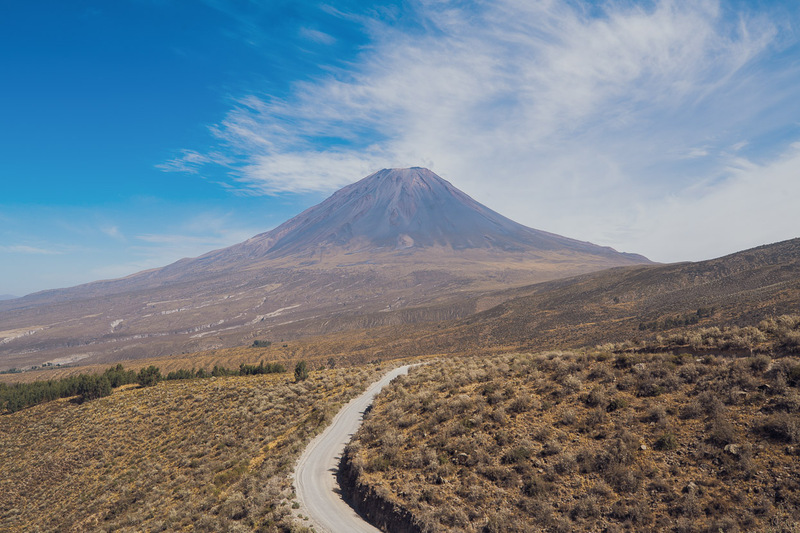 Our target was Volcan Ubinas (5620m), which is one of four volcanos that make up the Salinas y Aguada Blanca National Reserve. Ubinas is the most recently active of the four, last erupting in 2014 with ash and fumaroles. 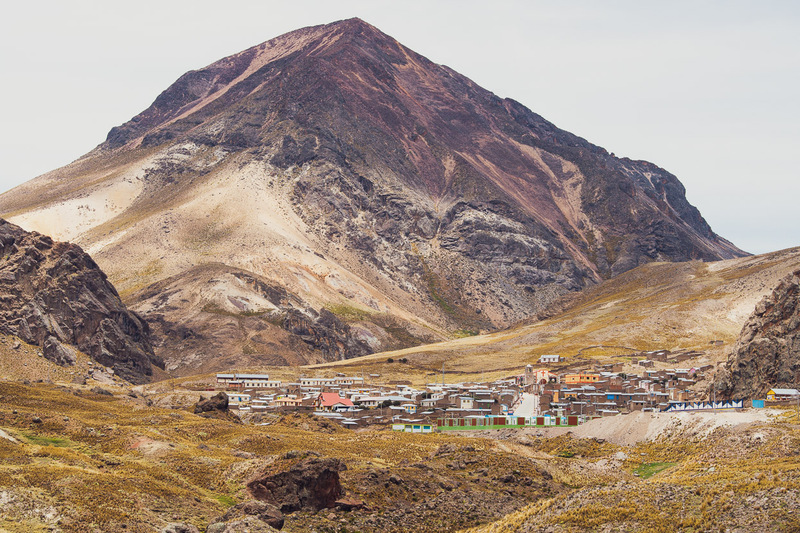 It’s the most active volcano in Peru, with small explosive eruptions occurring since the 16th century at an average rate of one eruption every twenty to thirty-three years. 2006–2007 saw a particularly active period. 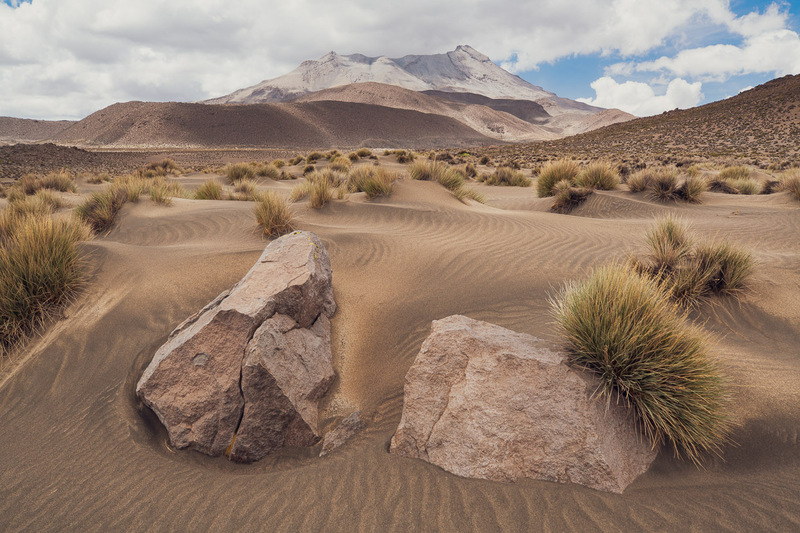 We turned off a good dirt road onto a sandy track that crossed the west flank of the mountain, close to the base of its cone. 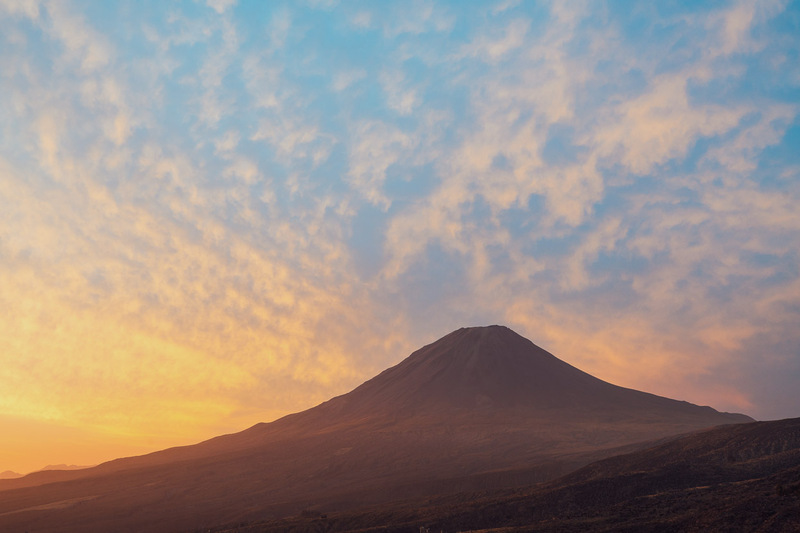 The mountain’s frequent activity was obvious – with the desert-like landscape of scoria, sand and the odd-lava bomb. 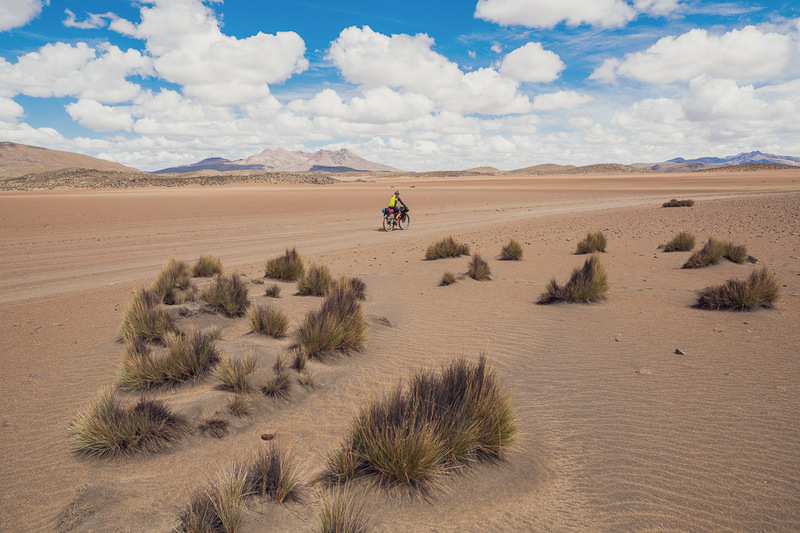 A wonderfully remote and stark place to be riding a bike. Definitely territory for bigger tyres. The sandy section lasts around 9.5km, although it’s not all soft and loose. 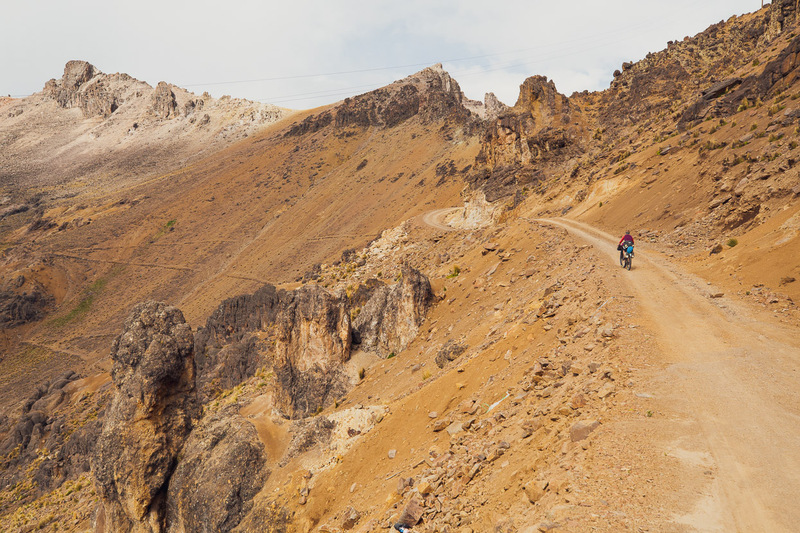 We joined a better road on the north side of the mountain and headed north east, climbing to a pass at 4700m. Meanwhile a thunderstorm was closing in and the sky darkening all around us. As we topped the pass our hands and bums (the contact points with our steel bikes) began to crackle and tingle with the electricity in the air. I was making a strange sizzling sound. We’ve stood on the tops of a lot of mountains and passes, but never experienced that before. Worried about lightning strike, we sped off down the hill, only to be hit by a huge hailstorm, which stung our faces as we dropped towards the first stream we’d seen all day. 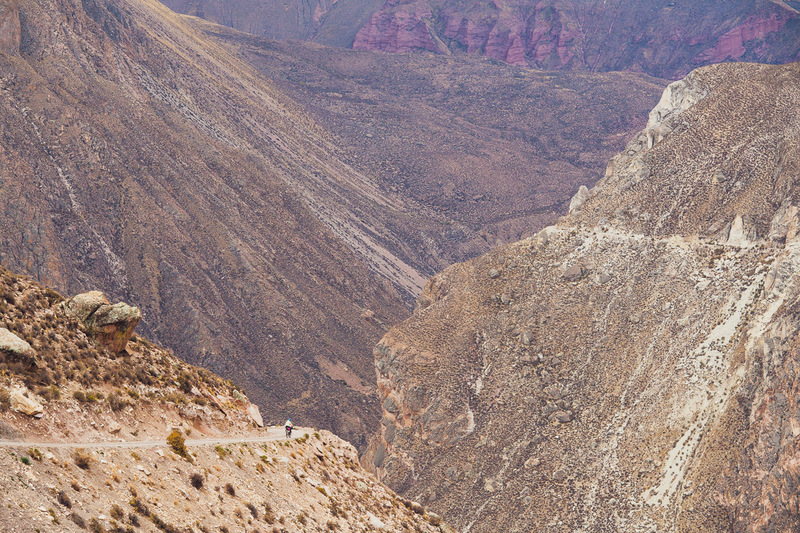 After crossing another high point the road dipped into a 25km descent into a canyon. 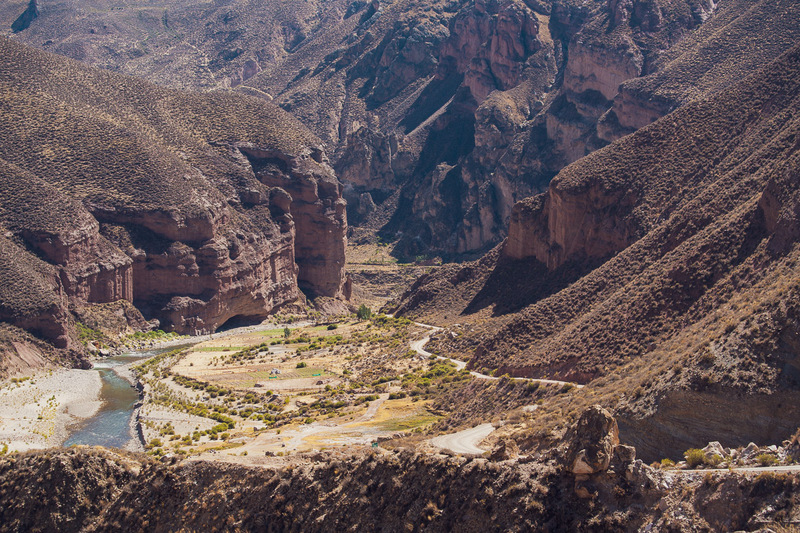 We’re not exactly sure of the name of this place, but have gone with the Rio Ichuña Canyon for now. 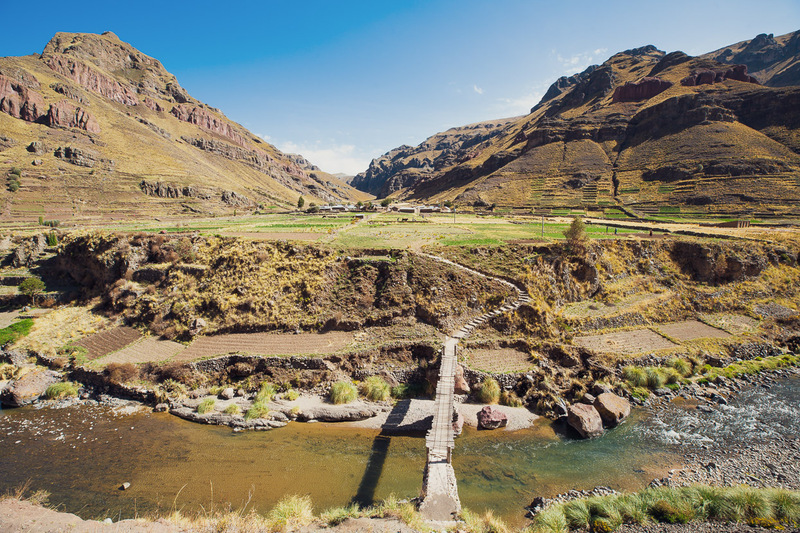 The Ichuña is one of several tributaries of the Rio Tambo, which drains to the Pacific Ocean. 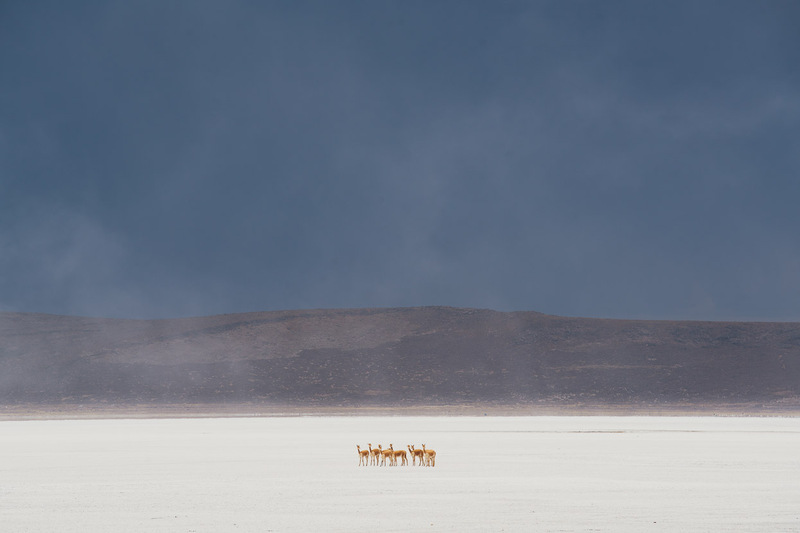 The further we go the more wild the landscape becomes. The road on the other side of the canyon was our route up-valley the following day. As we dropped into the canyon down switchbacks we caught sight of Lucco, on the other side. We spent the night in the very basic municipal hospedaje there (after we eventually found someone to open it for us) and dinner that night was chunks of alpaca meat and mote (boiled maize) courtesy of some lovely people who invited us to their hut for a meal, after we’d asked around for someone to cook us something. 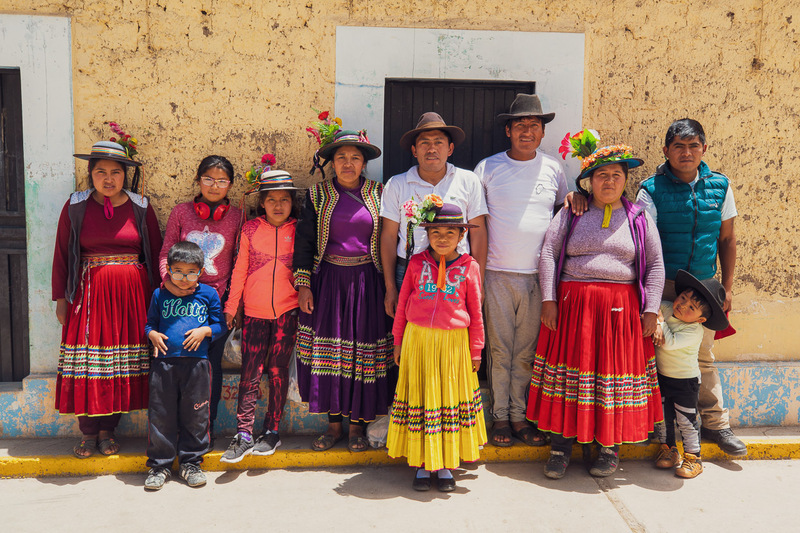 While we ate with our hands we talked about our trip, and heard a little about the village: there were about 100 Quechua people living there, but most of the young people had left in search of a ‘better’ life in Arequipa. 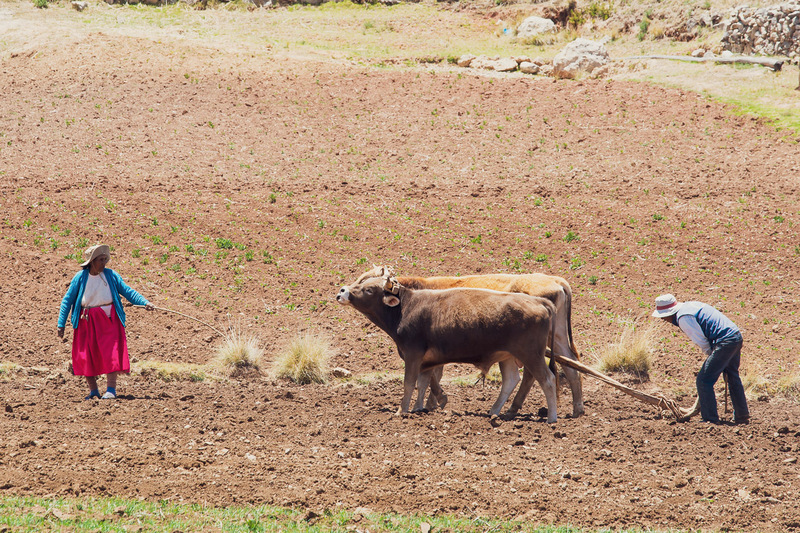 The village was suffering a water shortage (vital for crops). There is a big river below, but water would have to be pumped up, and water from the stream above was currently just a trickle. 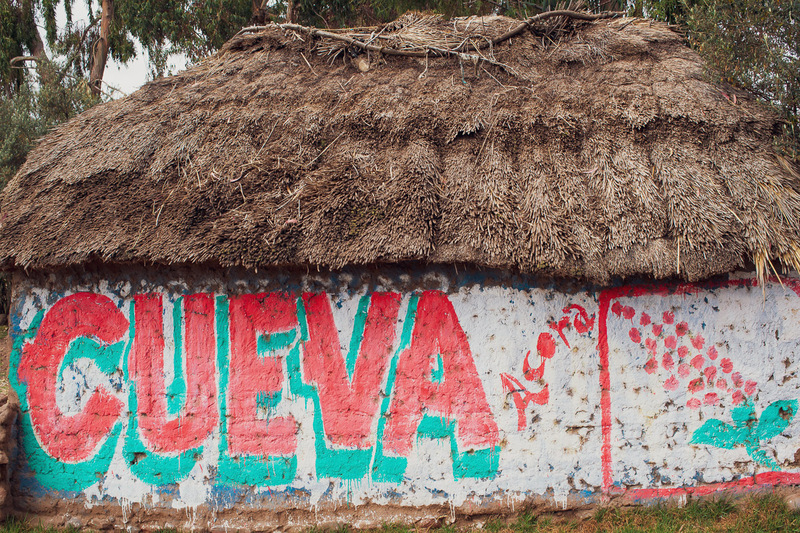 I couldn’t help but think this place must be on the brink, like so many villages in Peru. 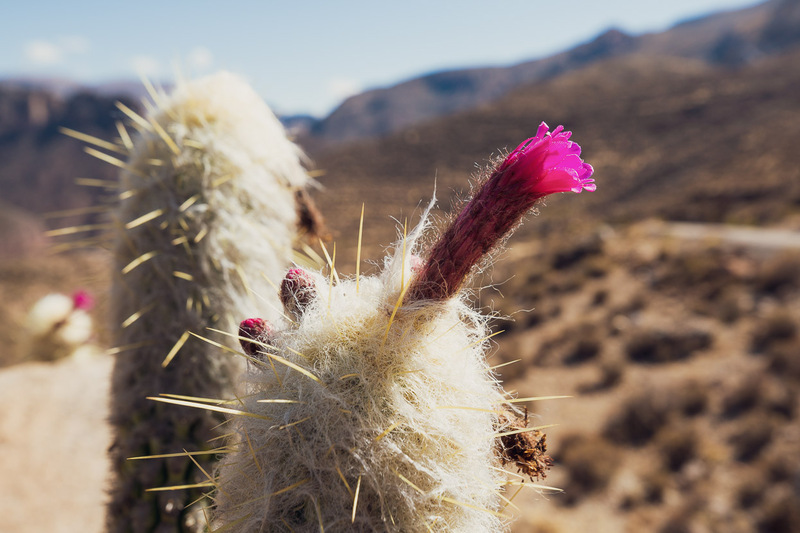 Facing the spectre of desertification once the icecaps have melted and the water sources run dry. Heading up-valley the next day was a beautiful ride through the canyon, with cactus in flower and plenty of time to absorb some epic geology. 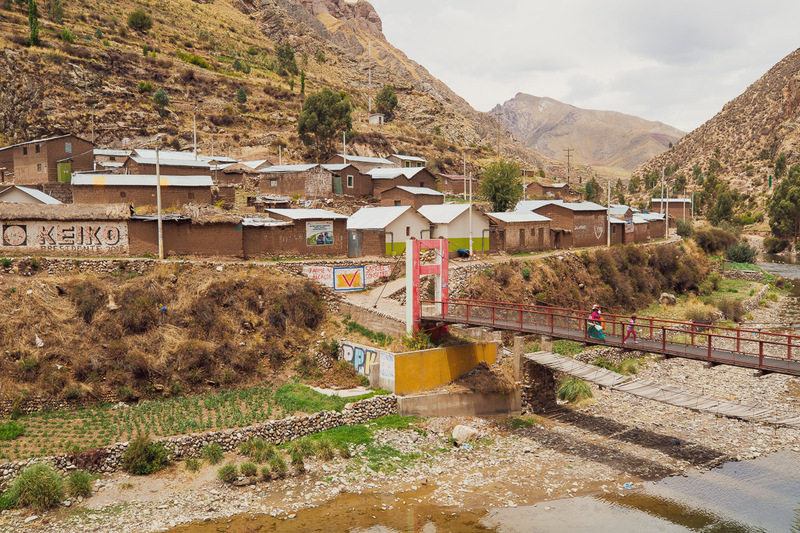 A few tiny villages and one small town punctuate the ride up to Ichuña. 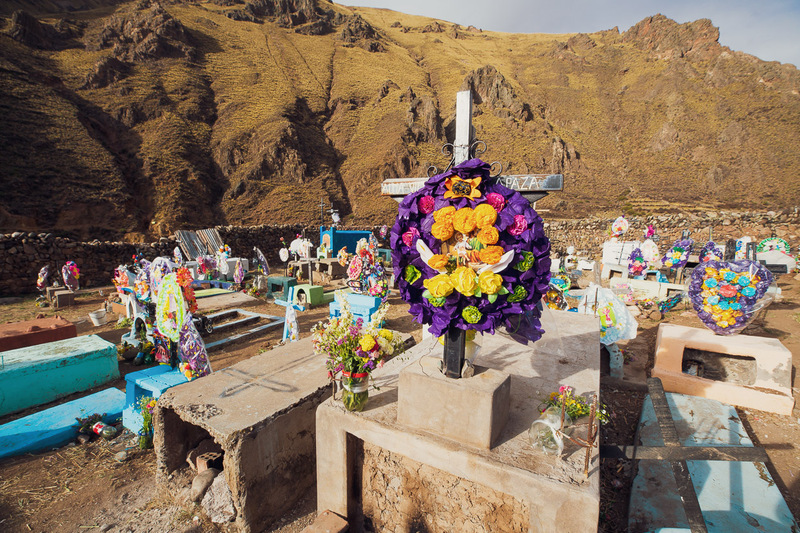 It was Dia de los Muertos (Day of the Dead), which is recognised and celebrated in Peru, although apparently without all the face painting and costume that has become fashionable in parts of Latin America and beyond. 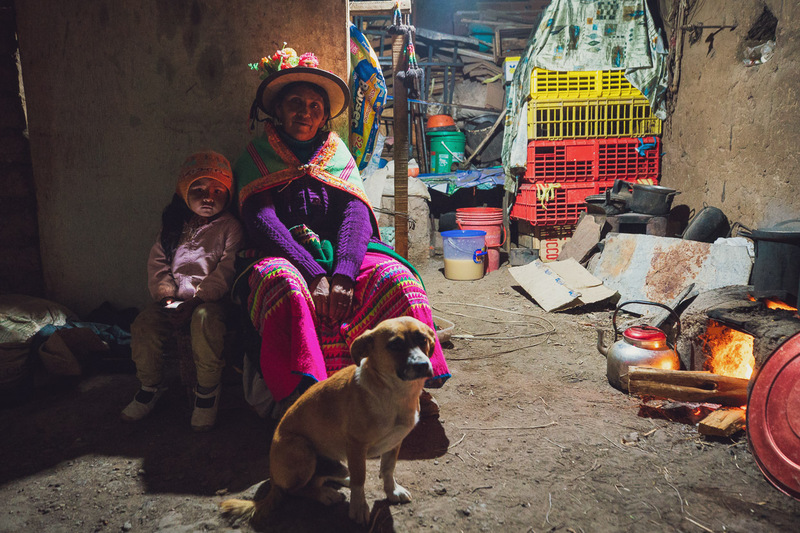 We saw lots of people in their best traditional outfits praying at graves or headed towards cemeteries to place offerings for the spirits of their loved ones – usually some maize, chicha, Inca Cola and candles – and lots of flowers. After four riding days we reached Ichuña, where there’s a hotel, several hospedajes and a 3-4 restaurants. We took a day off there to let our legs catch up with themselves and enjoy a bit of time just soaking up where we were. 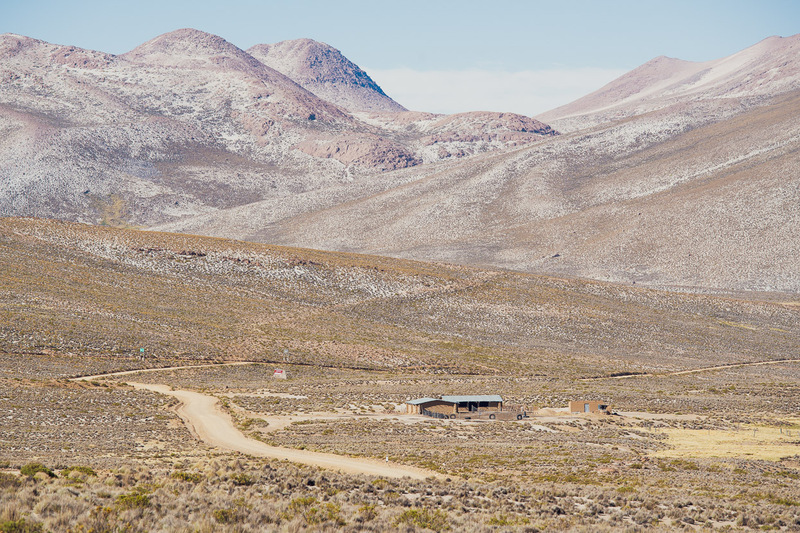 This is a remote valley that sees few outsiders, and so we were something of a curiosity in town; catching lots of stares, and a few questions. But people were very friendly, if not a little shy at first. Some people we talked to said they’d never seen a gringo there before, but one or two said they had seen someone on a bicycle pass through sometime in the past couple of years. 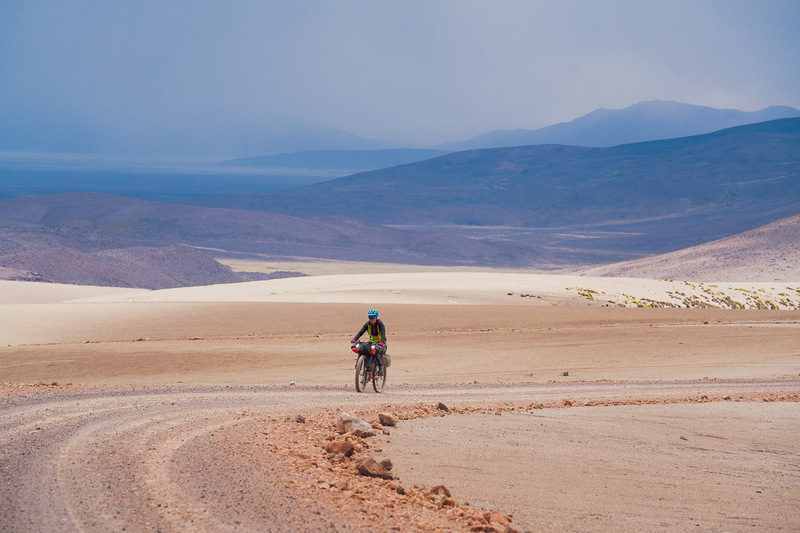 With some energy back in our legs we continued up-valley towards a crossing of the continental divide at a 4990m pass. Everything we knew about where we were headed (resupply options/road passages) we’d gleaned from Google satellite photos as many of the villages are not marked or named on Google Maps or Open Street Maps. But even the satellite photos were out of date, and we discovered that some of the ‘worst’ sections of the road had been bypassed by road detours bulldozed during the last three years. Our planned route was more direct though, so we took it anyway. This small town (San Antonio … something) does not appear on maps, but was a welcome sight to get some lunch and fill with water before the last big climb to the pass. The main stream beyond here is contaminated by mining, so we carried all we thought we’d need to get over the pass and down the other side. It was market day in the town so there were quite a few people around, and they were definitely interested to see us. 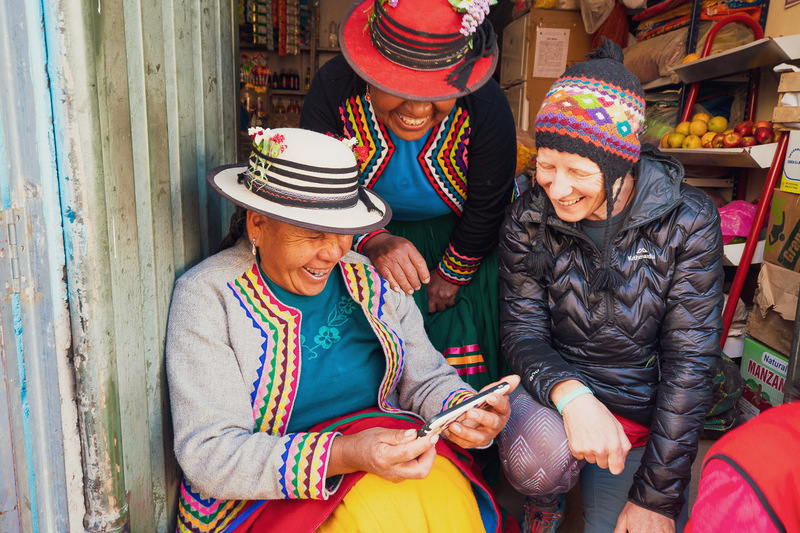 They were probably amazed with the casualness that we set about ordering a beetroot juice from a woman on the street and then eating a $2 lunch in the basic restaurant; acting as if we were locals. We’re so comfortable integrating into these small communities now that it feels quite natural, even if everybody is staring at us. 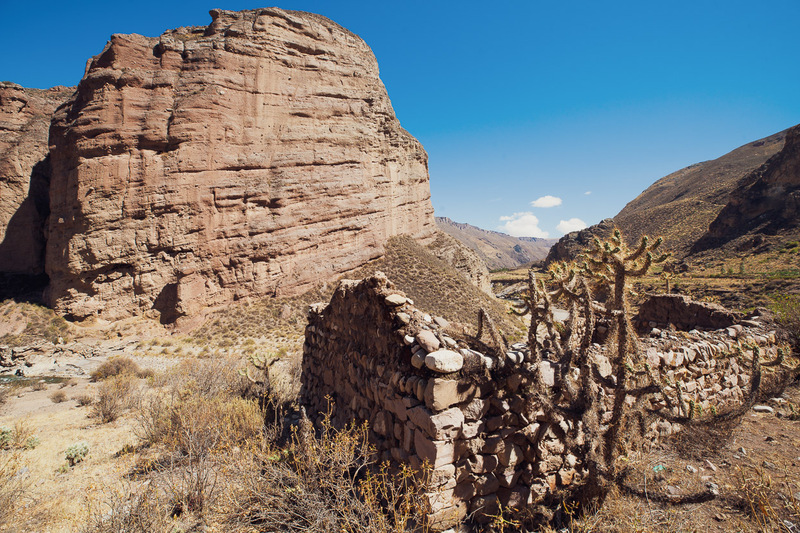 From what we could see the mine is abandoned, and some of it dates back to Spanish colonial times by the look of the decaying mud brick structures. 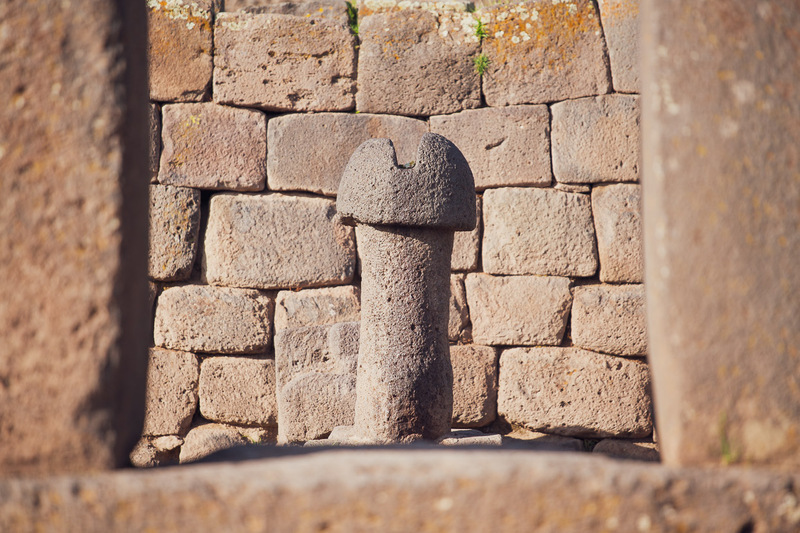 There were a few dodgy looking old shafts too. A gentle climb leads up valley, and then a final steeper set of switchbacks up to the pass. We’d lost a bit of acclimatisation hanging out in Arequipa (2300m), so we were puffing pretty hard. 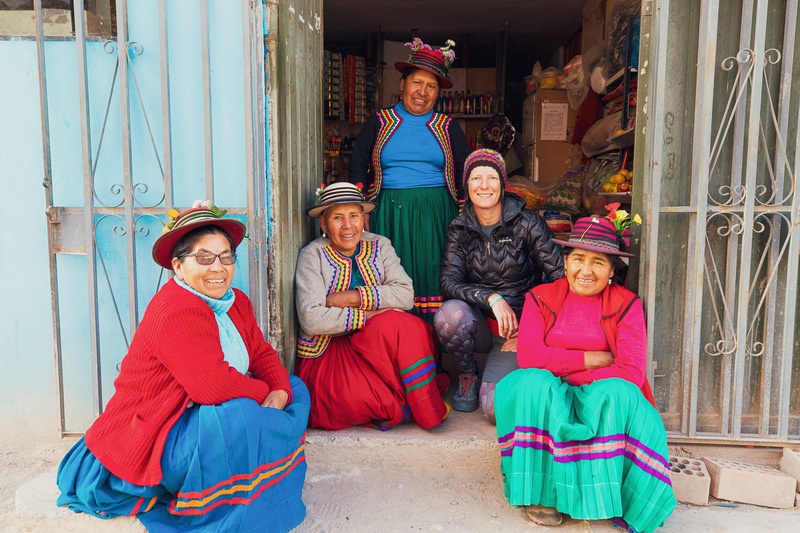 It felt good to finally top out at 4990m – our last crossing of Peru’s Continental Divide – and reflect for a moment on the journey that brought us here since we started along the Peruvian Andes over five months back. So many passes, so many epic climbs and crazy descents. In that time we’ve both adapted to the climate and the altitude. 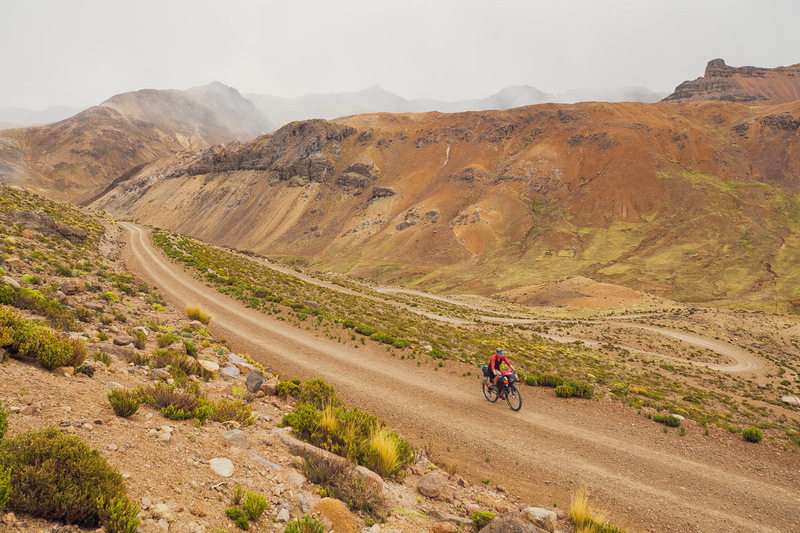 Earlier, reaching 4000m was a pretty big deal for us, but with enough acclimatisation, that elevation started to feel like sea level and 5000m became the new challenge (which we have surpassed a few times on the bikes now too). It’s amazing how the body and mind can adapt. Towards the bottom of the 18km descent the afternoon thunderstorm finally caught up with us and it began to rain heavily. We turned off into the village of Pichacane, hoping to find shelter, but the grim looking cluster of buildings looked be virtually abandoned. 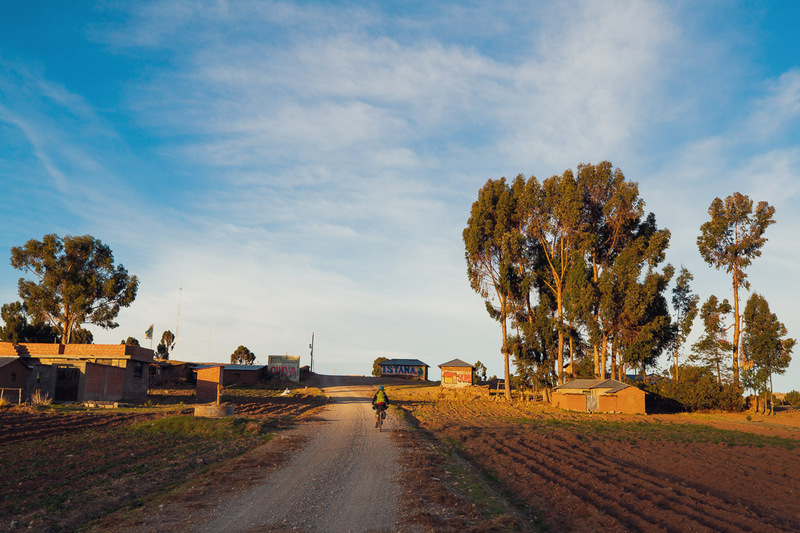 We spoke to a man who said we could possibly stay at the tambo down the road. 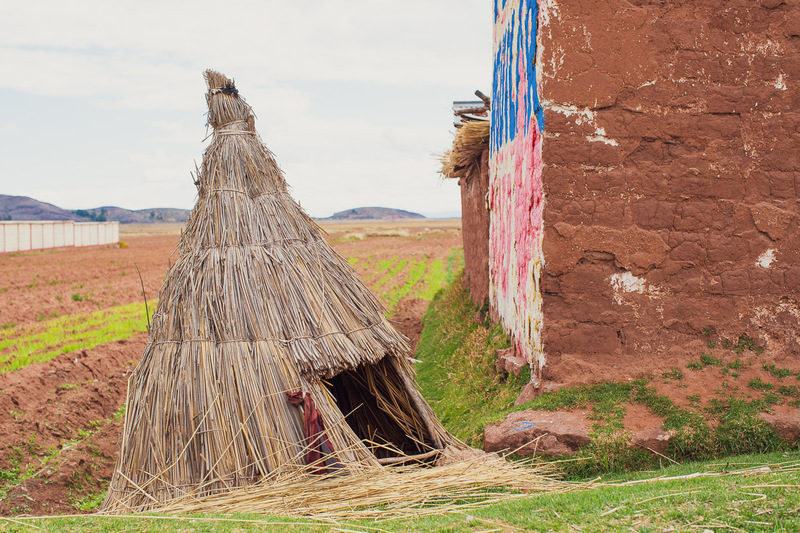 Tambo is Quechua for ‘resting place’, but in this case a tambo is a community building for meetings and hosting visitors. We found the building, and then an old lady who had some keys for the yard. She let us in so we could shelter in the porch. Later, near dark, the official caretaker turned up and after some initial grumbles and quick paperwork let us into the bunkroom. 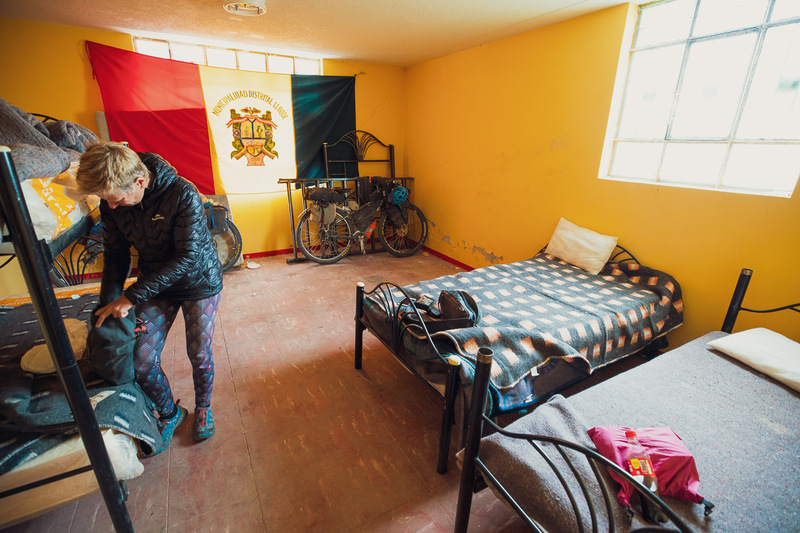 After some conversation he softened up and became quite friendly, and we were happy to have a bed for the night – for free – and a lot more comfortable than many of the grungy hotels we’ve stayed in. 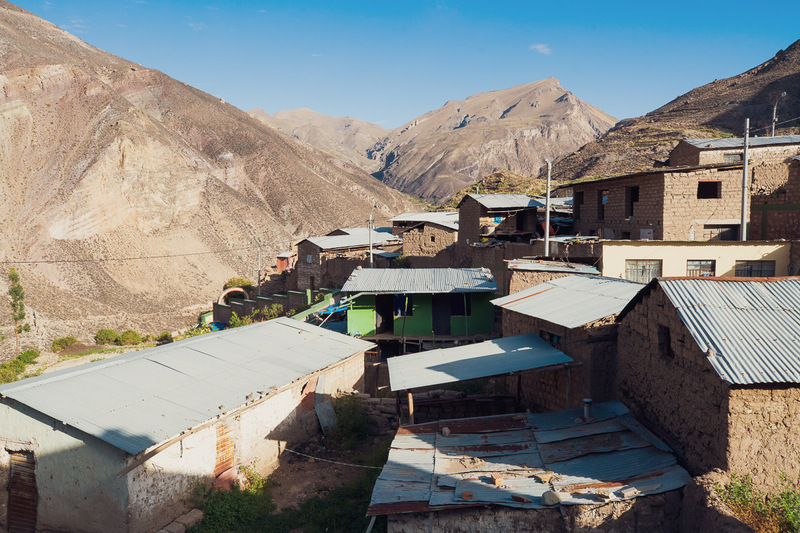 A brighter morning followed and we got up early to knock out the final 18km to the Inca site we wanted to see at Cutimbo. 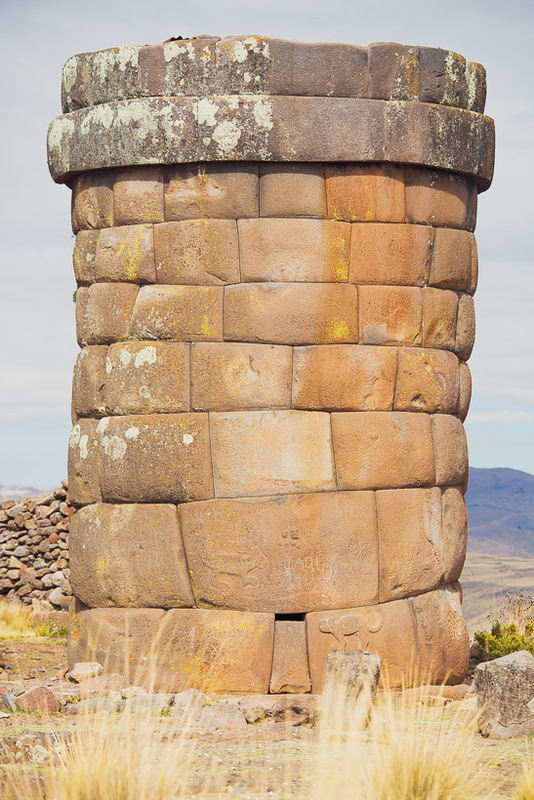 We were there by 7am, and hiked up to the top of a basalt-capped mesa to see the incredible funerary towers (Chullpas) there. 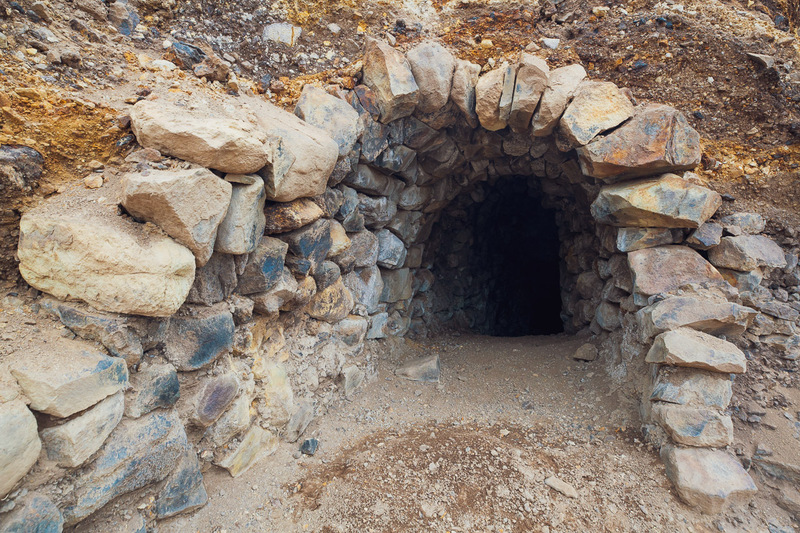 Each hundreds of years old and engineered from perfectly cut blocks of basalt. 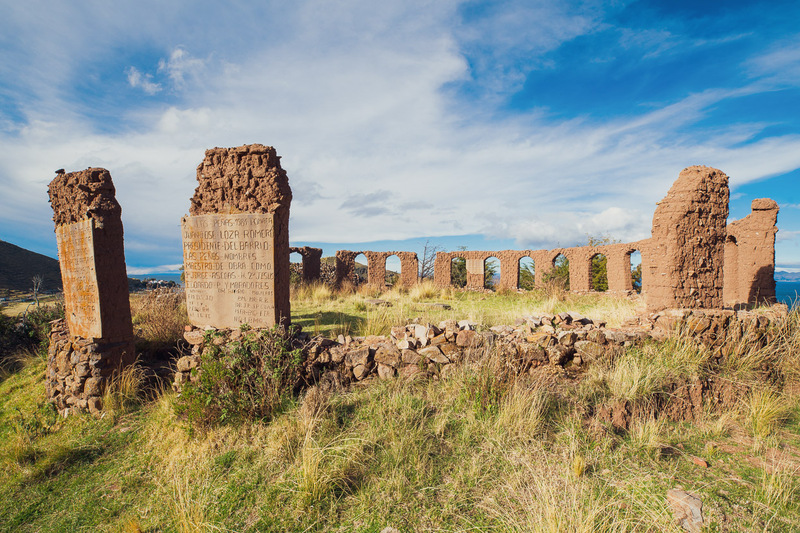 The site is one of the most important pre-Hispanic burial grounds on the Andean plateau. 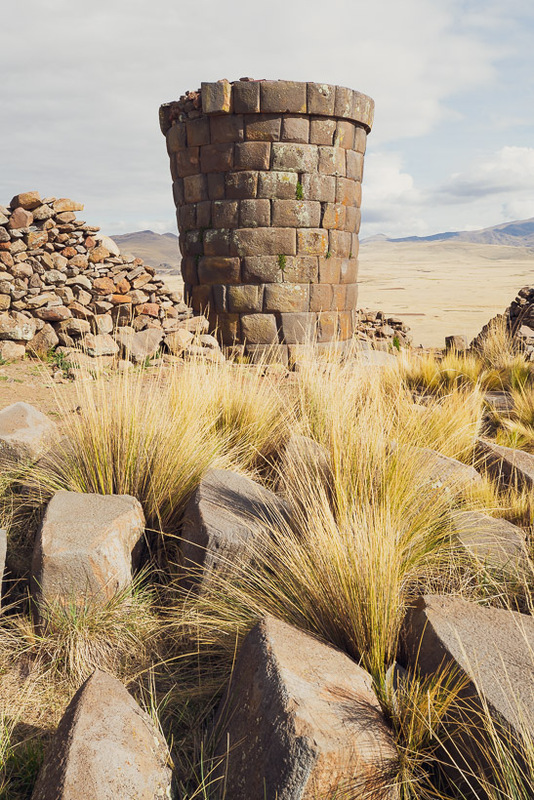 The towers all have small entrances that face the Equinox sunrise, and one tower features carvings of two mythical Aymara dogs, said to accompany the soul of the deceased to the Otherworld. Another carving depicts two humanoid faces: the deceased (the initiate) and their celestial bride. 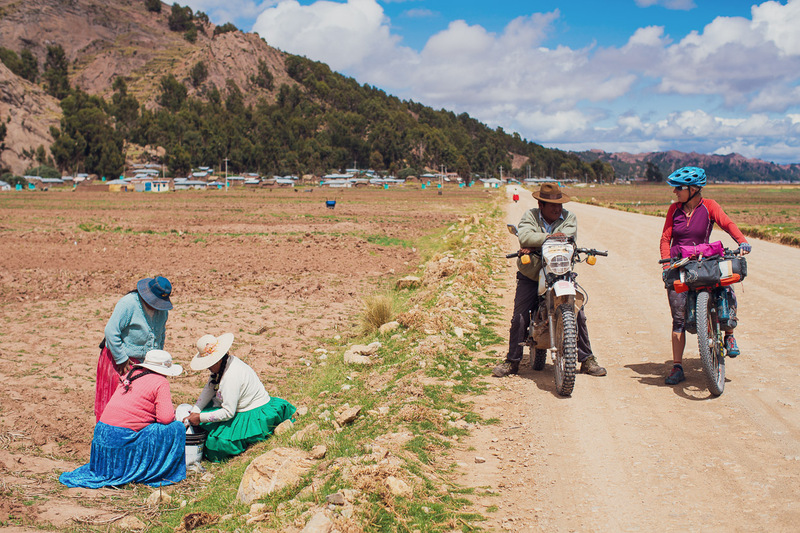 After an hour or two at the site we headed towards Lake Titicaca on empty dirt roads. 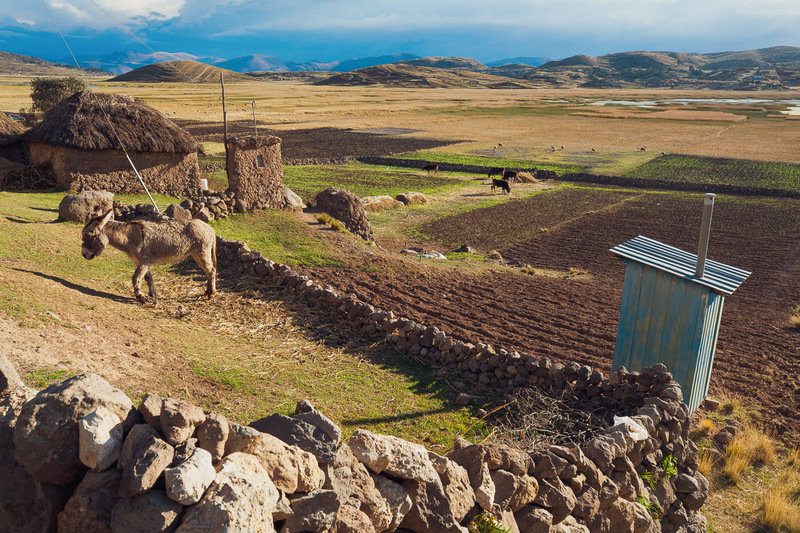 After the endless ranges of the Continental Divide we found ourselves in a new landscape of broad plains, mesas and small rolling hills: the Lake Titicaca Basin. 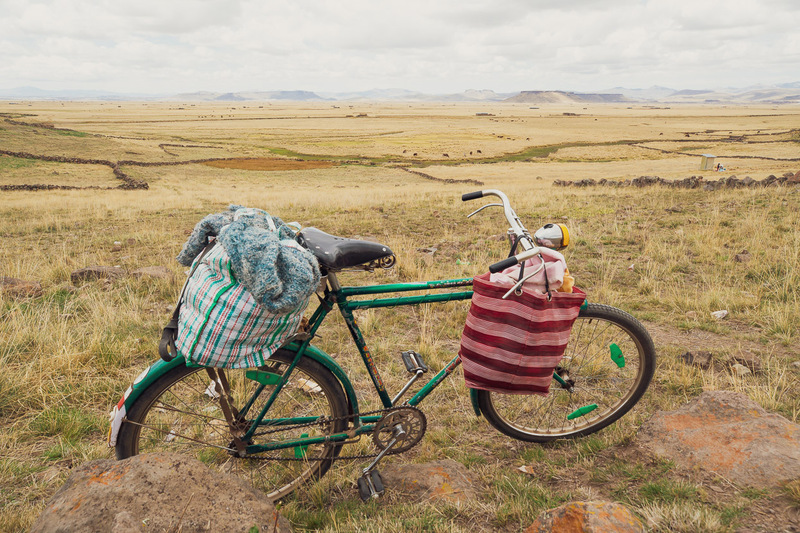 We’ve scarcely seen a bicycle in Peru, outside of big towns, but here it’s flat enough that locals are willing to ride around, so there’s lots of lovely vintage single speed bikes. 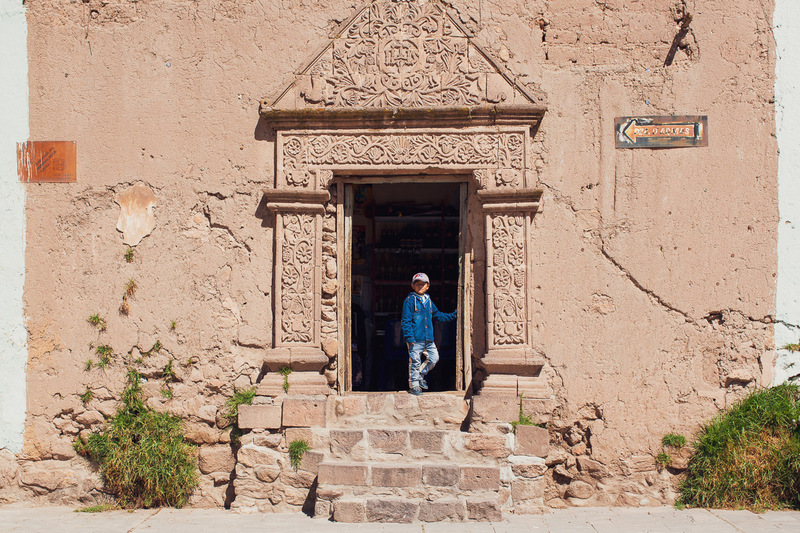 Our next stop was Chucuito, a small historic village that was once an Inca centre. 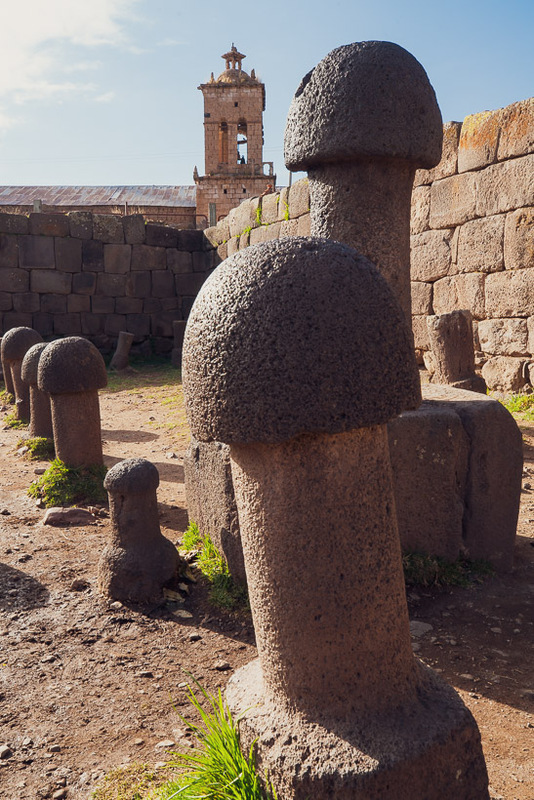 The town has a couple of beautiful old churches and notably, a Inca stone complex – the Templo de la Fertilidad – filled with basalt phalluses Well, some people say they might be mushrooms, but the intent of the creators seemed pretty clear to us. 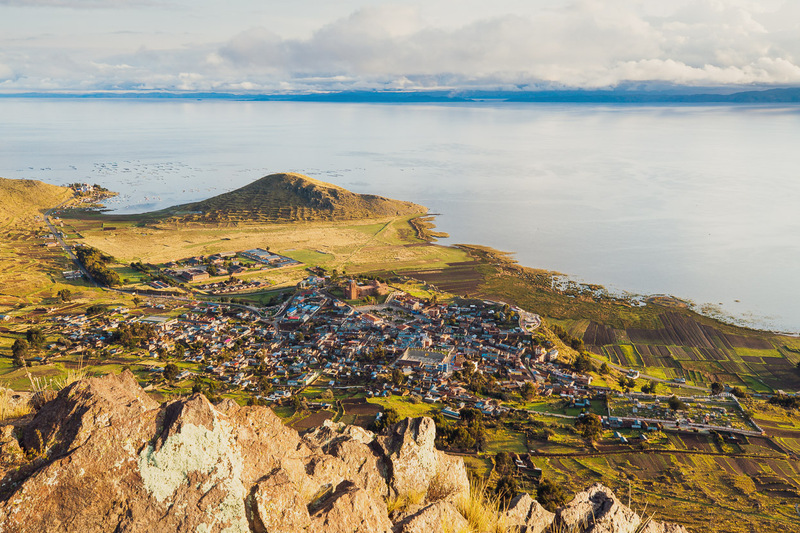 Lake Titicaca is one of those almost mythical places that I’ve heard of since childhood, and it was cool to finally see this massive, high altitude lake – the biggest in South America. 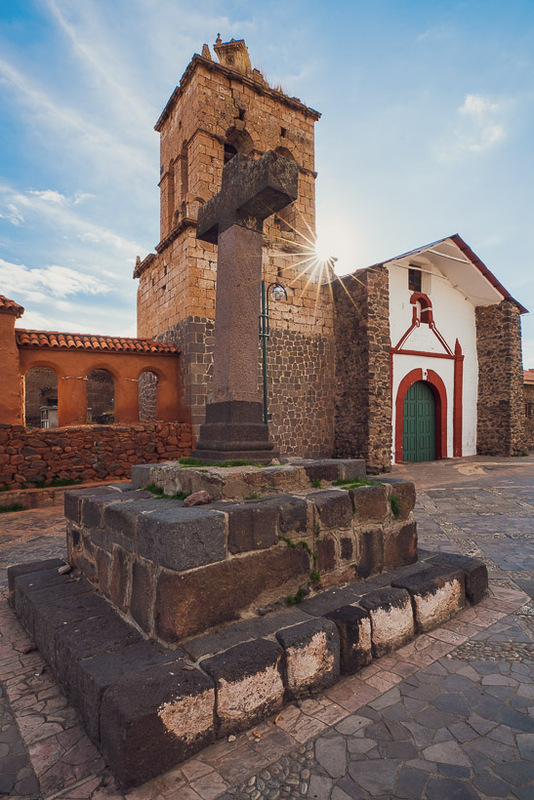 It’s long been a centre of human civilisation and culture – from the pre-inca Aymara, to the height of the Inca, through to the modern Aymara who still inhabit the region now and retain a strong cultural identity. 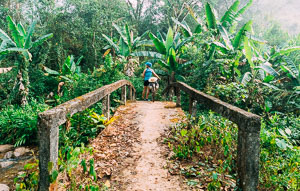 The Pan American highway cuts a route down the western side of the lake, but we wanted to avoid that as much as possible and planned a route that hugged the coast, where practical. 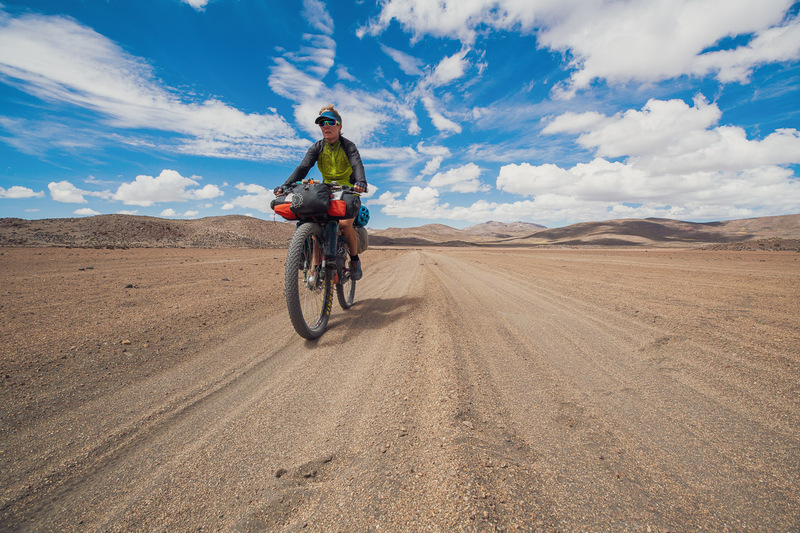 In doing so we discovered some excellent riding (especially on the eastern side of the prominent peninsula east of Chucuito) right through to Ilave, where we joined the highway for the remainder of the route to the Bolivian border. 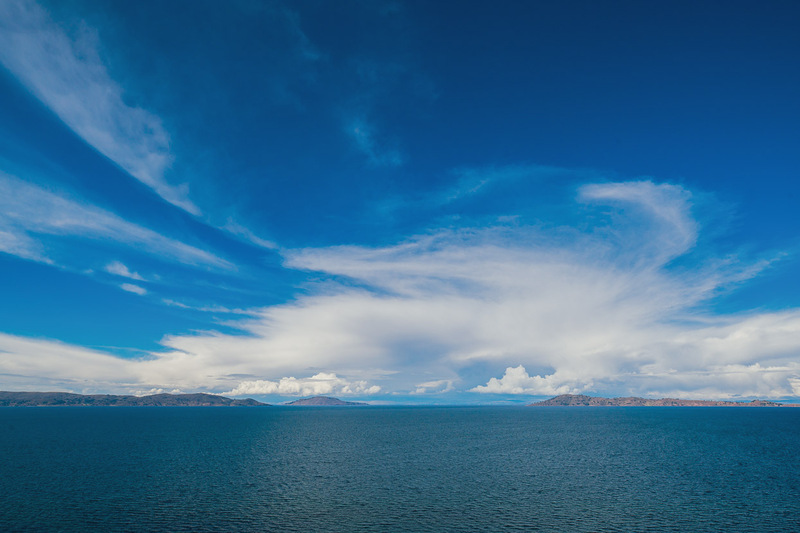 The nice thing about Lake Titicaca at this time of year is the climate: it’s much milder than the divide and the lake is big enough to create its own ‘weather window’. We experienced no frosts at night, and hot days (when in direct sun). 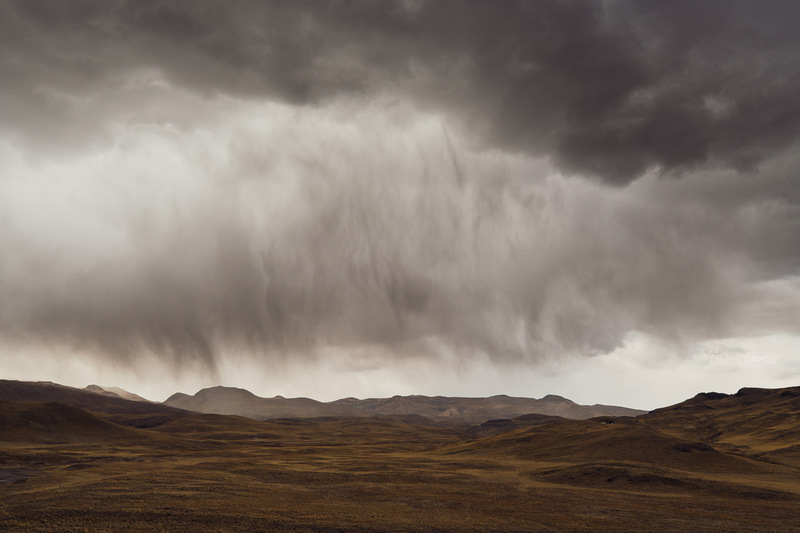 The rainy season is well underway in the mountains though and the view east was always dominated by thunderheads and thick cloud over the eastern cordilleras. 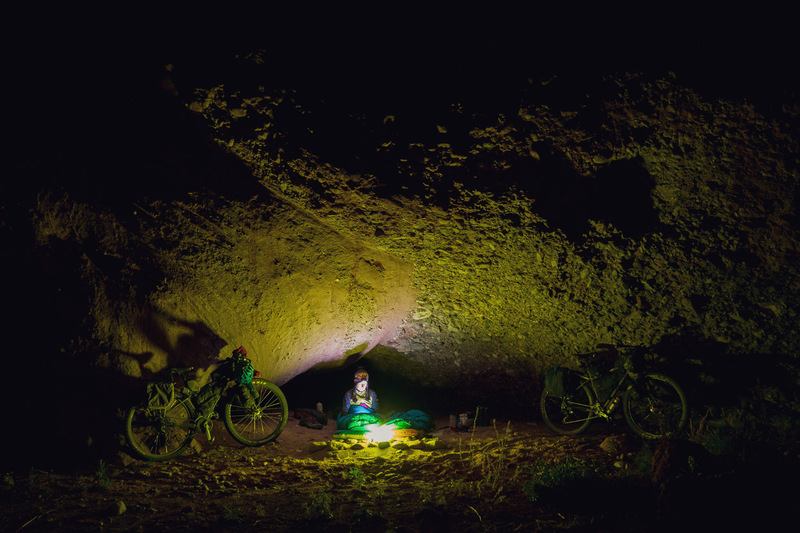 We cycled out to another peninsula village, Santa Rosa de Yanaque, and rode right out to its southern tip, bivving for the night in a cave. 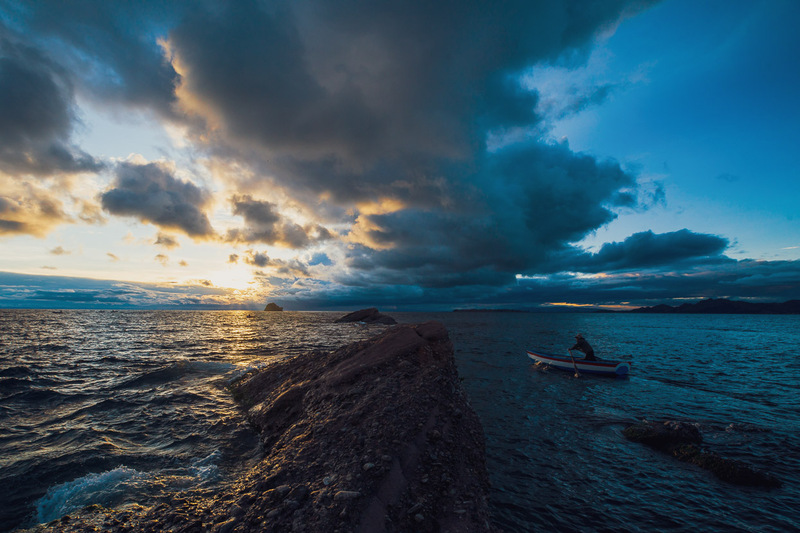 I wandered out on the rocky headland for some sunrise photography, while a flurry of fishermen headed out for an early catch. 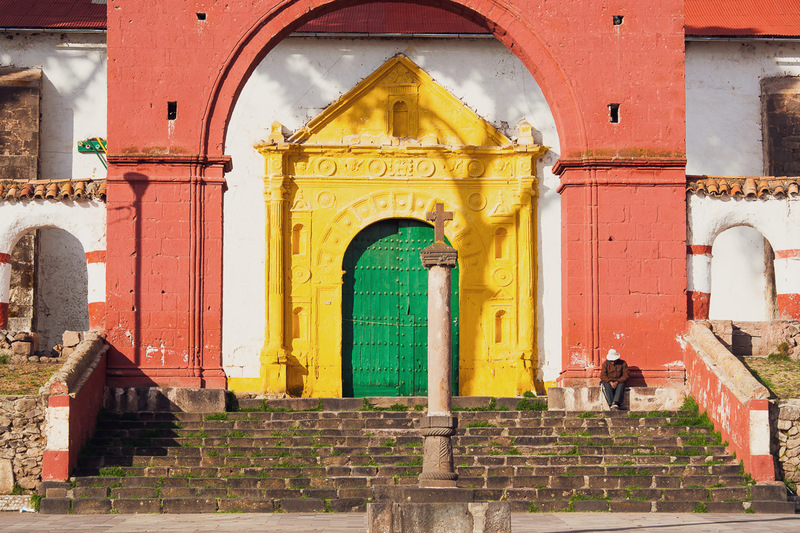 Our last night in Peru (for now, hopefully), was spent in Pomata, a picturesque small town dominated by its huge church. Despite being just off the highway there’s only one (overpriced) hospedaje and no regular restaurant but it’s still a nice place to spend the night. We got up early in the morning and followed a steep pathway – The Stations of the Cross – to a huge crucifix at the top of a hill above the village. A perfect vantage point for early morning light. 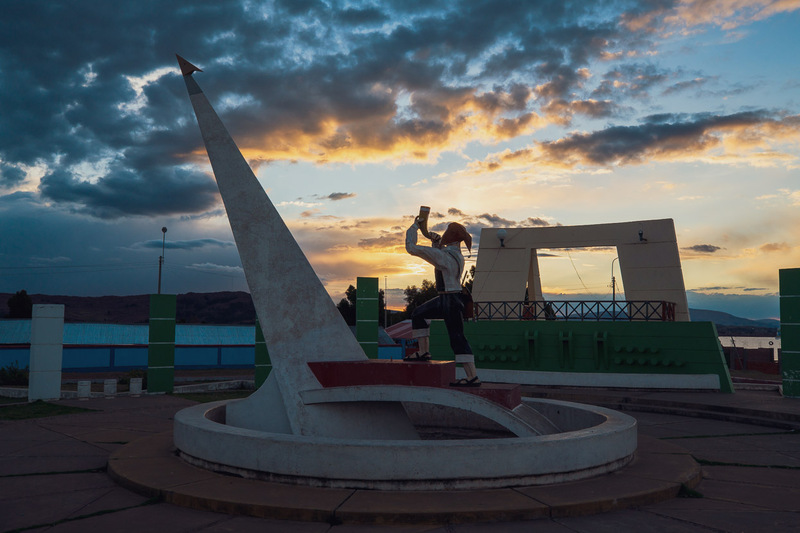 Yunguyo was our final town in Peru, for a last snack before we crossed the border into Bolivia and rode a casual 8km into the nice little tourist town of Copacabana. 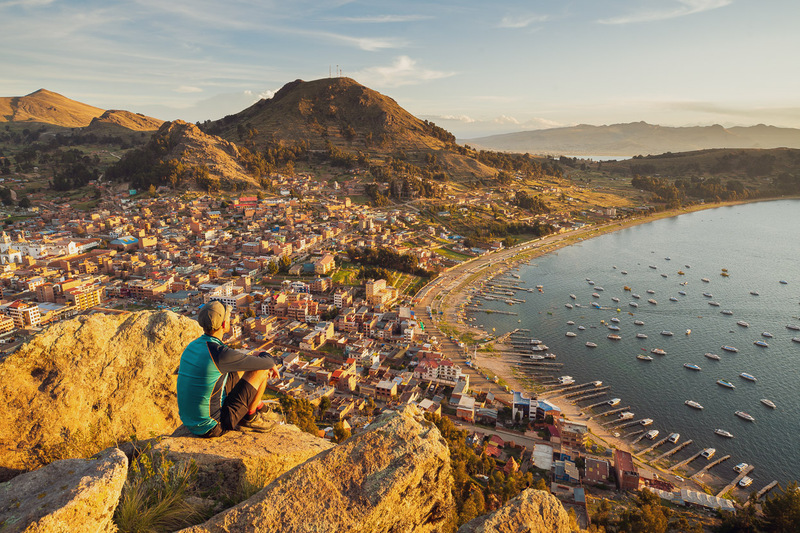 We’ve been here two days now, resting, eating and hiking to the top of the local hill and religious shrine to take in more views of Lake Titicaca. 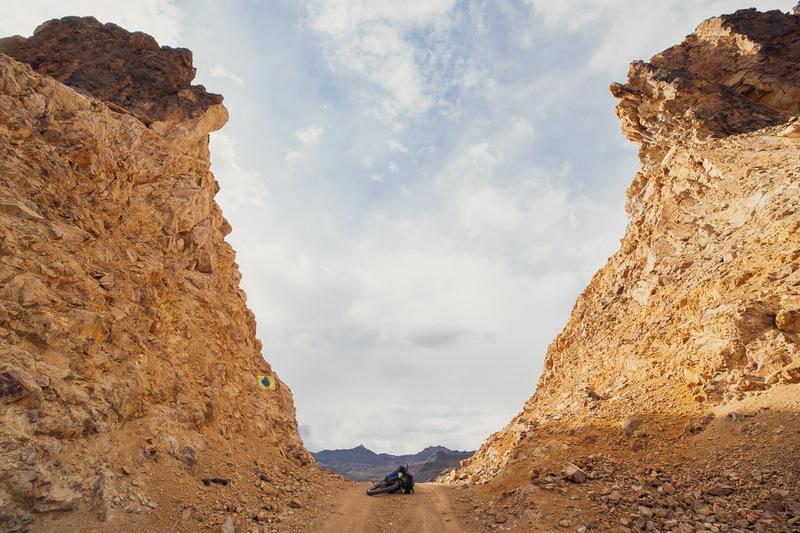 It’s a nice place to hang out and reflect on what has been an epic ride though the mountain of Peru. 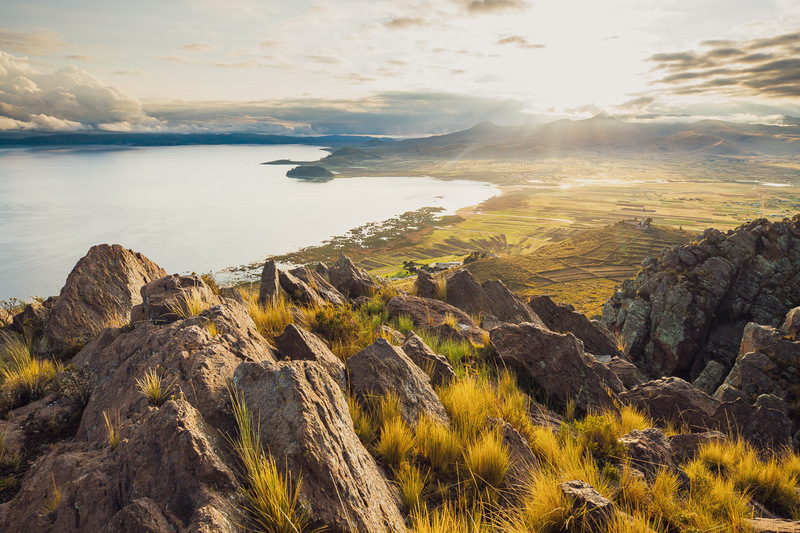 From here we’ll ride up the eastern side of the lake (another three days in Bolivia) and try our luck at the Peru border. Creating content for this site – as much as we love it – is time consuming and adds to travel costs. Every little bit helps, and your contributions motivate us to work on more bicycle travel-related content. Up coming: GPX tracks and Gear Reviews. Fantastic pictures of a fantastic tour. Thanks. Thank you – comments always appreciated 🙂 Glad you enjoy it. a closet Dead Head so like the glimpses of Marks’s hat! Glad the photos remind you of your time in the Cordillera Blanca. Such a beautiful range. I’d love to come back with climbing gear! Do you ride also? Oh and cool that you like the Dead too. 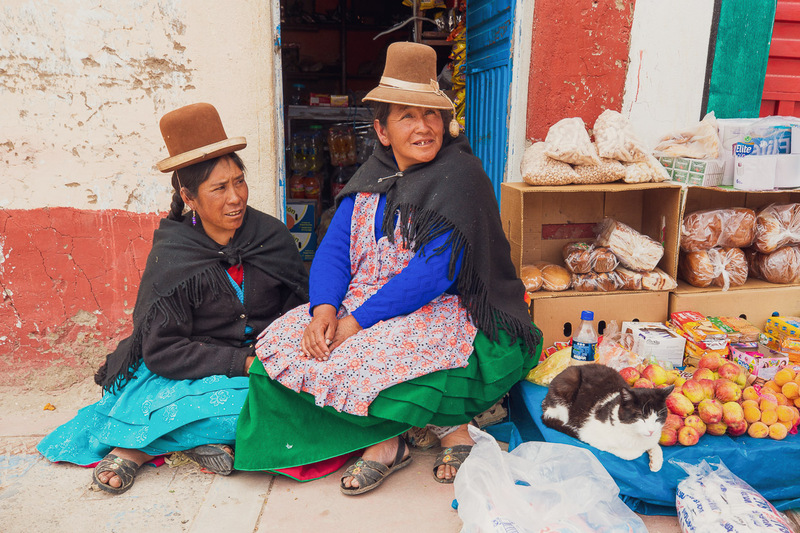 That patch was custom sewn onto the cap in Huaraz of all places! The description of your climb to Volcan Ubinas was rather terrifying and it’s definitely going to give me a nightmare or two, as my fear of lightning is already abnormally big. 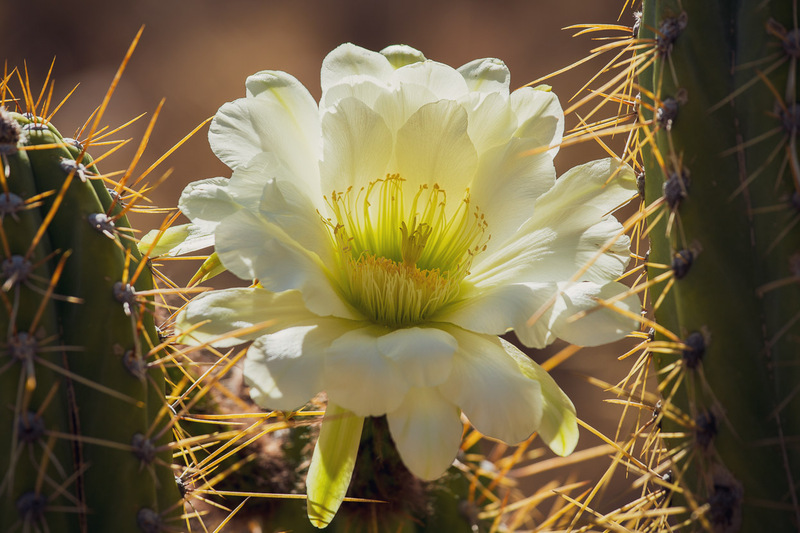 Espectacular!…the photos, the description, the journey.